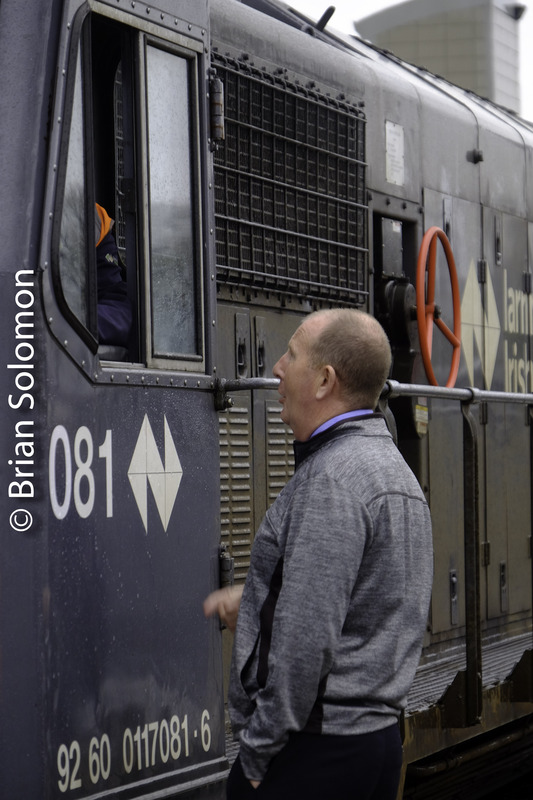 Brian Solomon sits down with Trains’ passenger columnist Bob Johnston and retired Amtrak engineer Craig Willett to talk about the national passenger carrier. This is the second in a multi-part conversation that began in Episode 2. 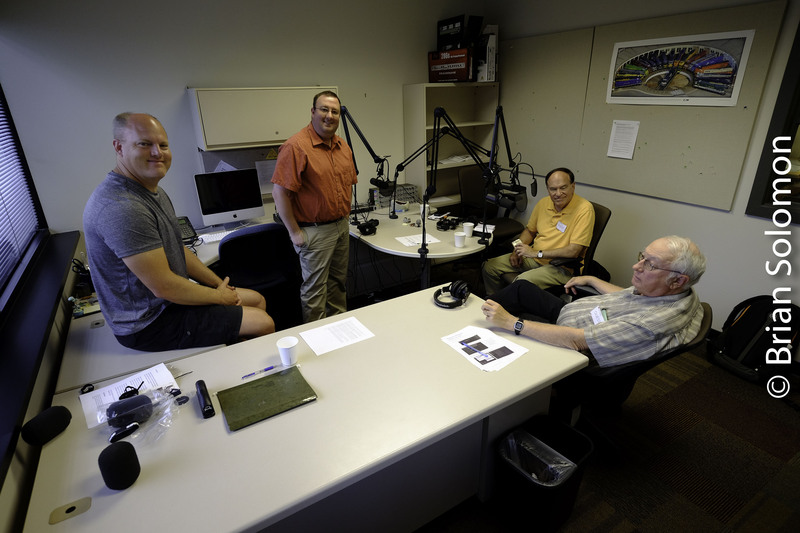 Chris Guss, Trains’ Brian Schmidt, Bob Johnston and Craig Willett in the Kalmbach recording studio in August 2018. Exposed with a FujiFilm XT1. Amtrak’s Cardinal on the old Chesapeake & Ohio in Virginia. 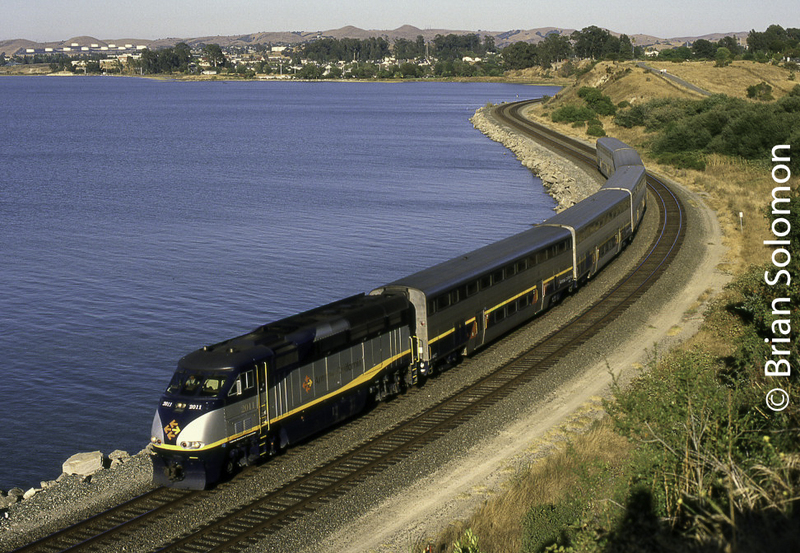 Amtrak Capitols passenger train on the Union Pacific at Pinole, California in May 2008. ITS ALIVE! Lumix LX-7 wakes from the Dead! 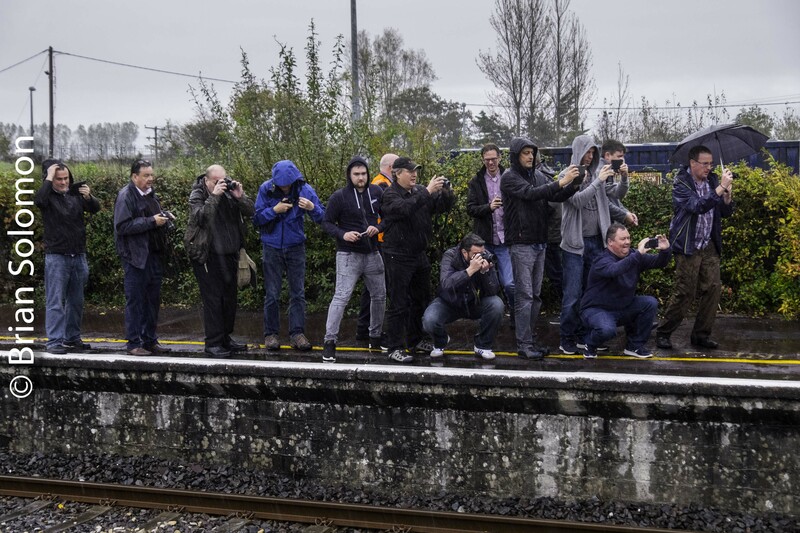 I’d reported that my Lumix LX7 coiled up (failed) during the Railway Preservation Society of Ireland’s fall tour earlier this month. Excessive dampness contributed to the camera’s lifeless qualities. For several days it was unresponsive. On the advice of Eric Rosenthal, I placed the camera in a Ziplock back filled with rice and left it there for more than 72 hours. Then I gave it another couple of days. Finally, with a freshly charged battery I turned it on. The lens hesitated, attempted to extend from the camera body, and then retracted, leading to an error message in the display. I repeated this action, but on the second attempted, grabbed the front element of the lens and coaxed to the normal extended position. In so doing I freed it from some grit that had been impeding its progress. I then turned the camera on-off several times to ensure that it was working. Since that time it seems to have been performing as expected. My zombie Lumix can’t be trusted though. Once a camera demonstrates failure, I never assume that it will perform flawlessly. So, I’ll still be seeking the LX7s inevitable replacement. Below are some of the photos from the Zombie Lumix. 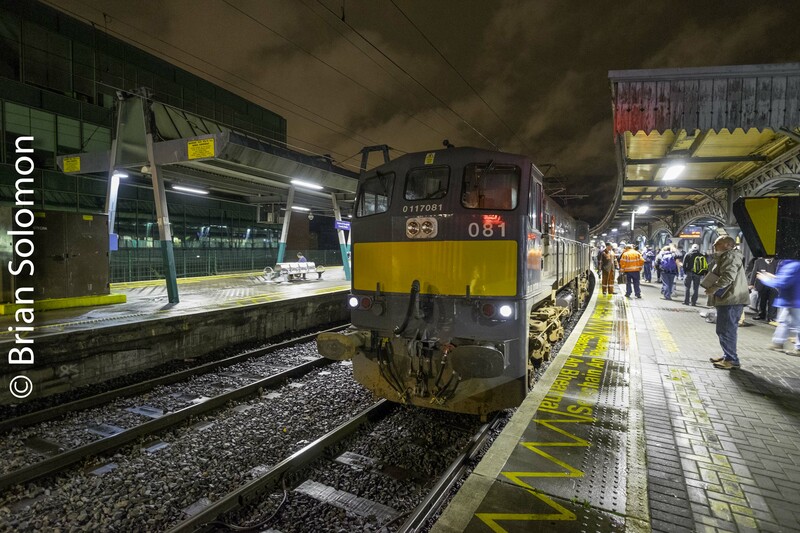 Up Irish Rail Mark4 set from Cork arriving at Dublin Heuston Station. Lumix LX7 photo. 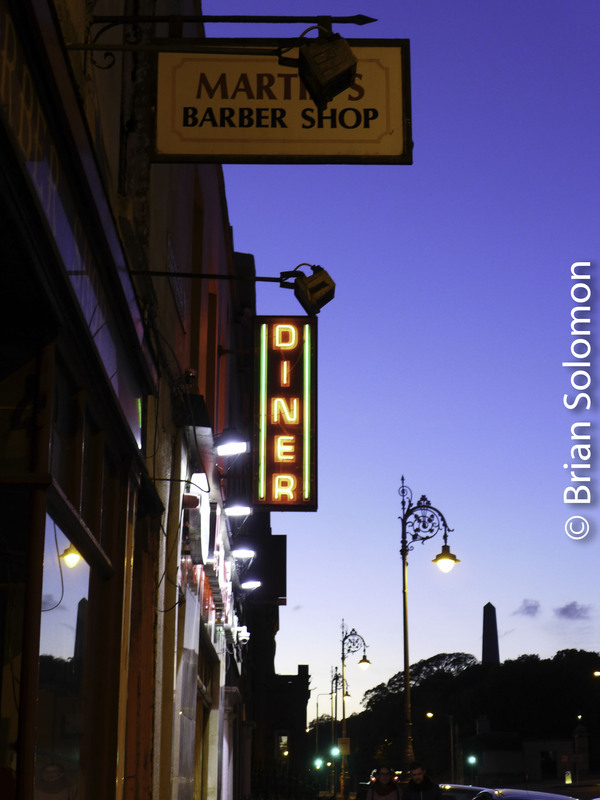 Parkgate Street in Dublin at sunset. 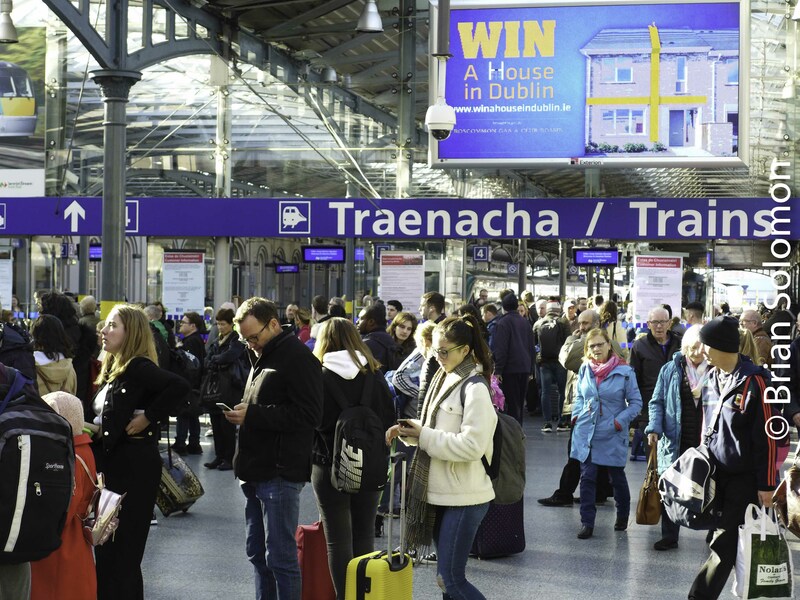 Busy day at Heuston Station in Dublin. 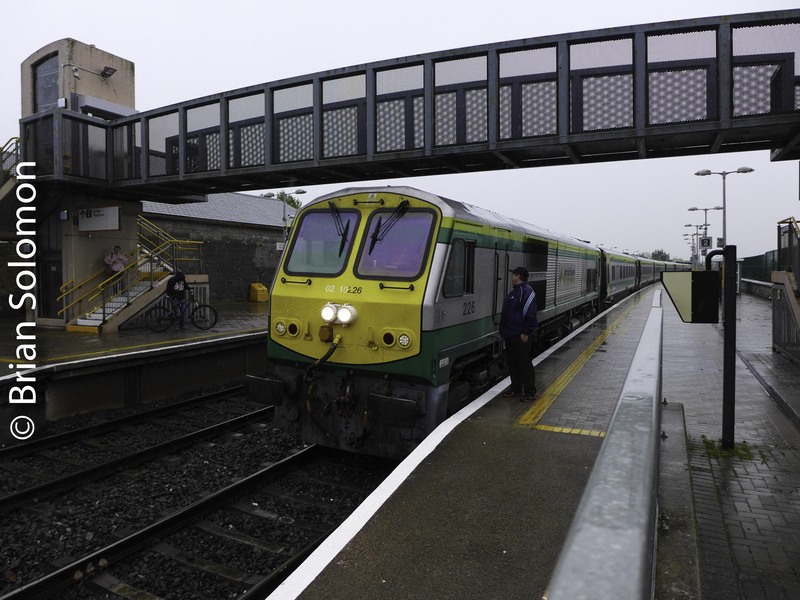 Irish Rail at Portarlington, Then and Now Views: Deja Vu all over again. I was trolling through the archives searching for views of Irish Rail’s Mark 2 airbrake carriages and came across this view of class 071 locomotive 088 at Portarlington in summer 1998. 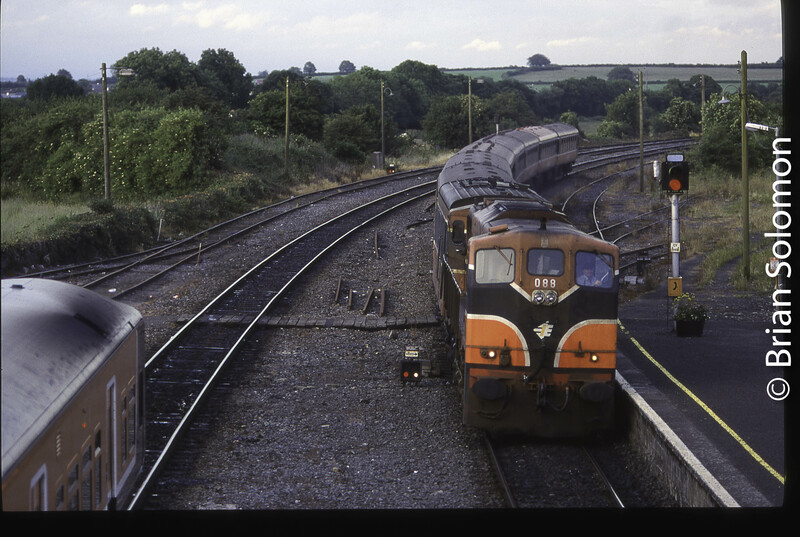 Irish Rail 088 leads a westward train of Mark 2 airbrake carriages at Portarlington in summer 1988. Exposed on Fujichrome Sensia (100 ISO) using a Nikon F3T with 135mm lens. 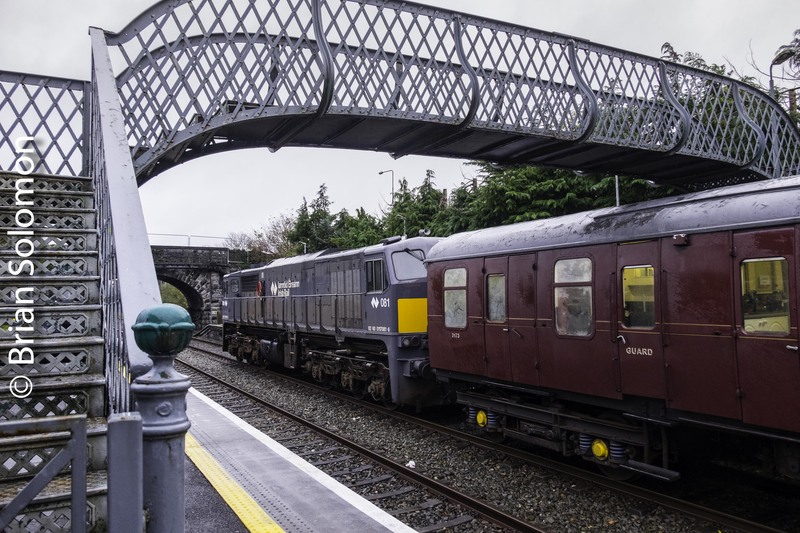 It makes for a fascinating comparison with a similar photo I made of the same locomotive hauling the recent Railway Preservation Society of Ireland autumn tour arriving at the modern Portarlington station. 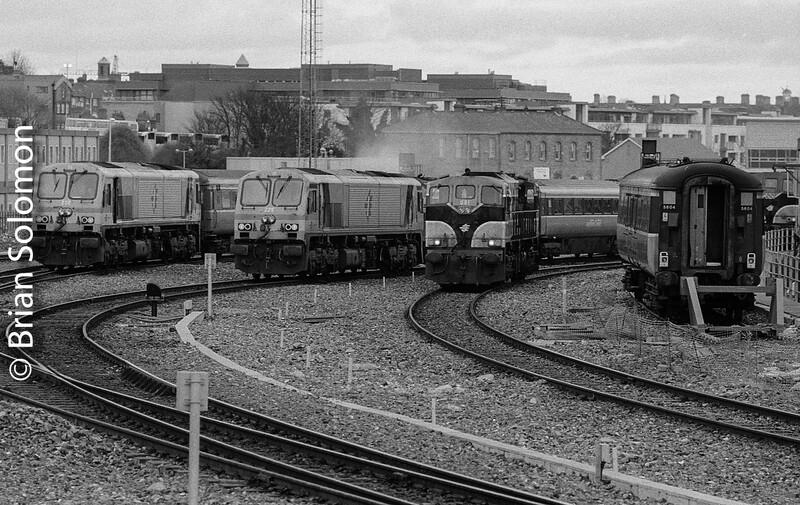 Same locomotive, same location, looking the same direction but viewed more than 20 years apart. 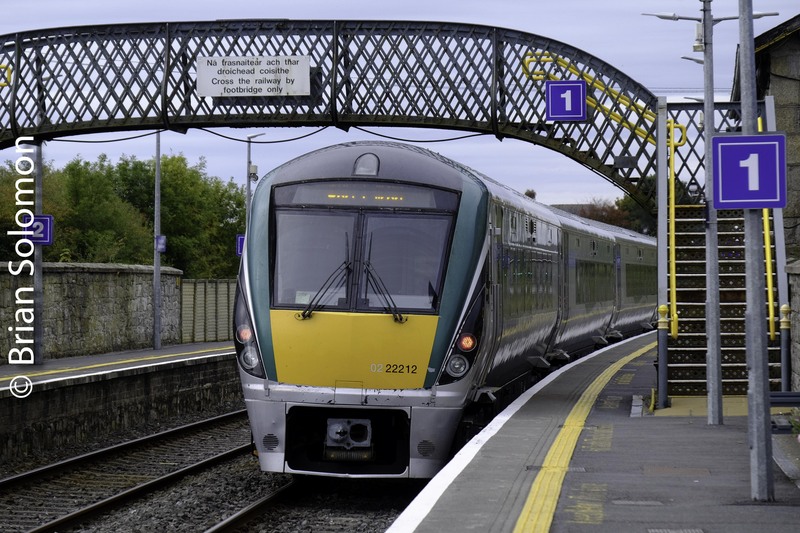 The tracks have been re-aligned, platforms extended, new footbridge constructed, and houses built in the distance, while 088 now wears Irish Rail’s gray and yellow livery. In retrospect, I wish I’d located the vintage photograph prior to the tour so I could more closely match the angle. 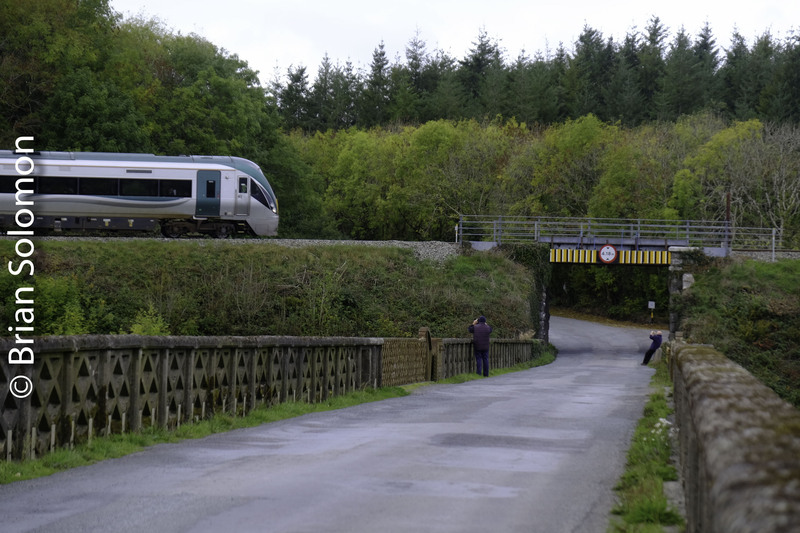 The 1998 view is made from the old footbridge which is now out of service. 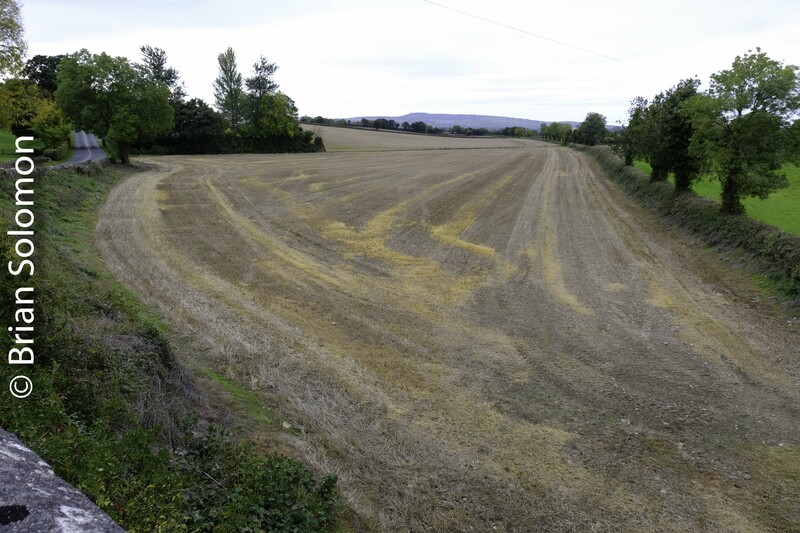 The October 2018 photo was exposed from the modern footbridge, which is situated further east and slightly higher. 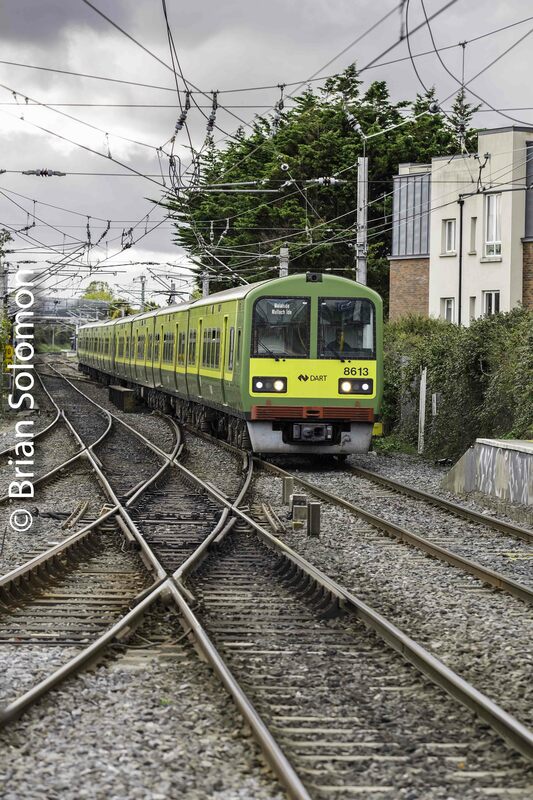 Irish Rail 227 in Three Photos. 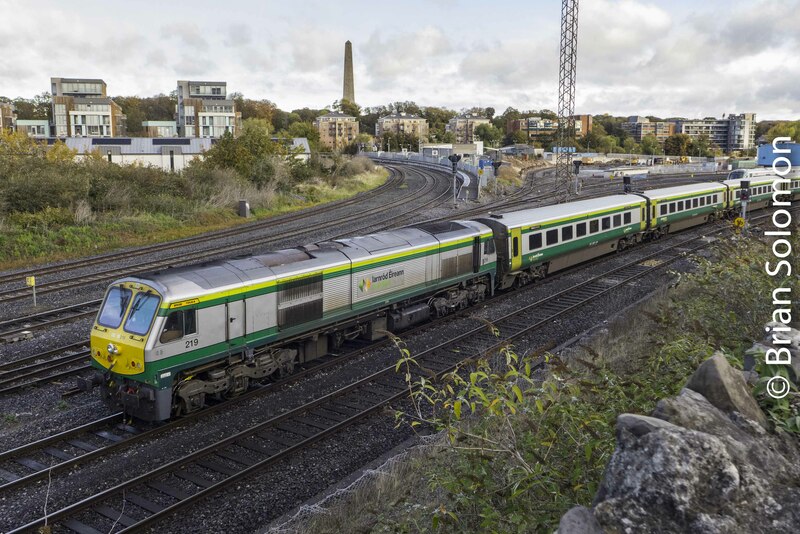 Irish Rail 227 is another of the workhorse 201 class diesels. 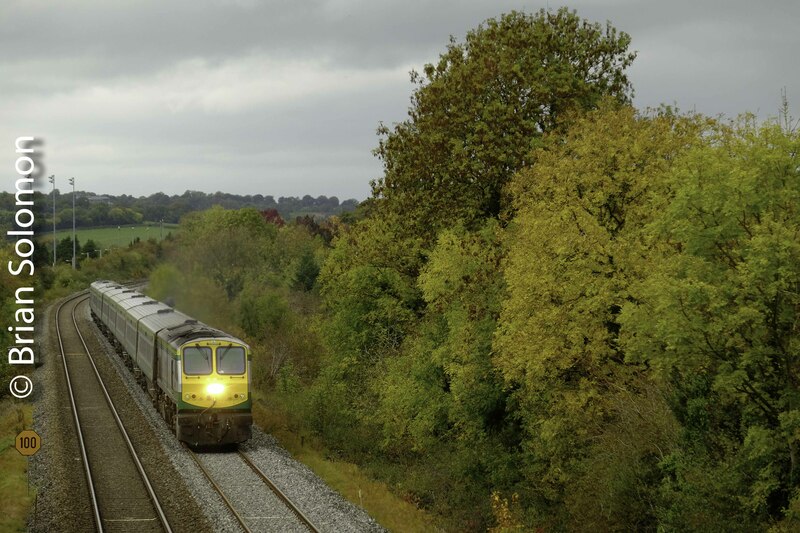 This is part of my continuing series featuring Irish Rail’s Class 201s to commemorate my 20 years of photography on Irish Railways. 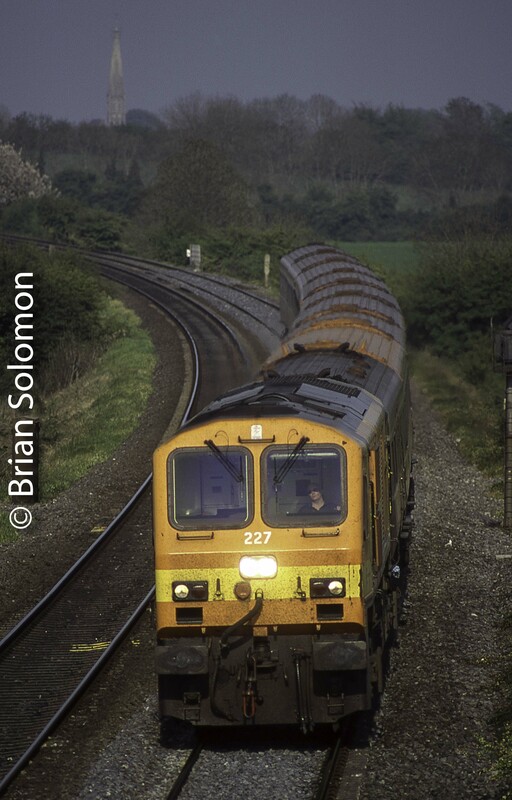 Irish Rail 227 works down road at Cherryville Junction on 6 May 2000. Exposed using a Nikon N90S fitted 400mm Tokina Lens on Fujichrome Sensia II (100 ISO). 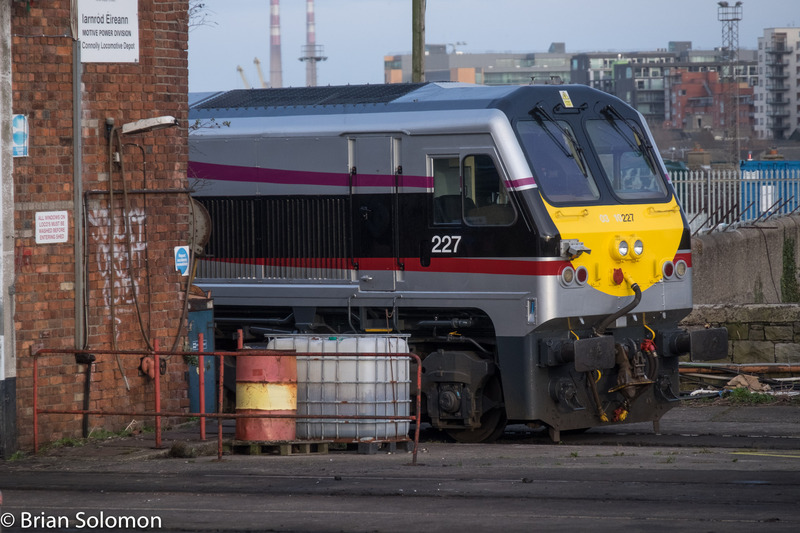 Connolly shed, the rarely photographed end of 227. 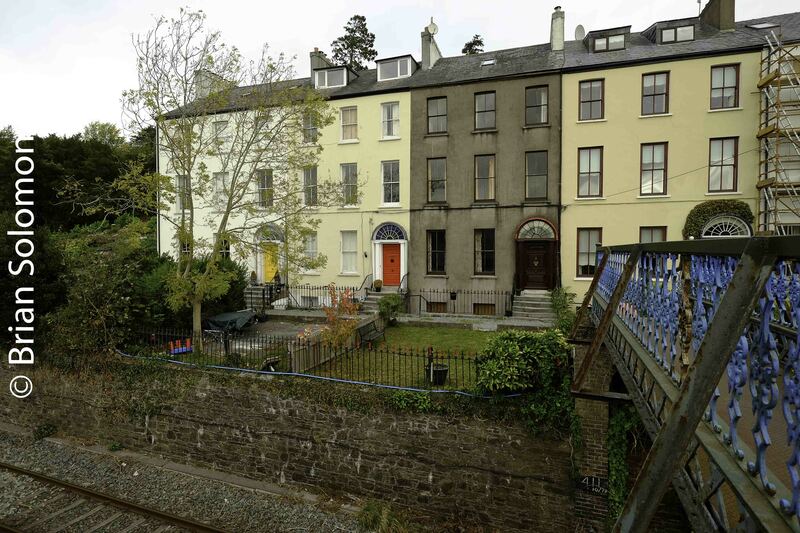 Victorian Railway: Cobh Branch at Woodhill, Tivoli, Cork. 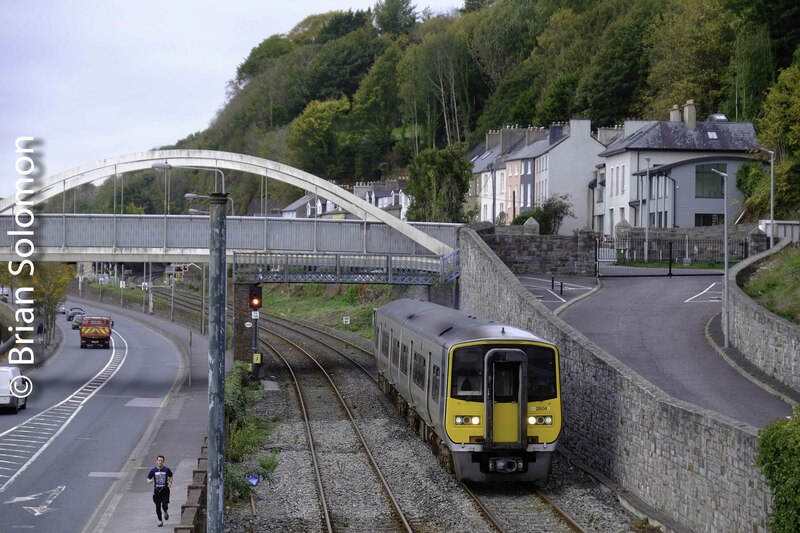 Irish Rail’s Cobh Branch retains a Victorian character running east from Kent Station through Woodhill, Tivoli in Cork City. 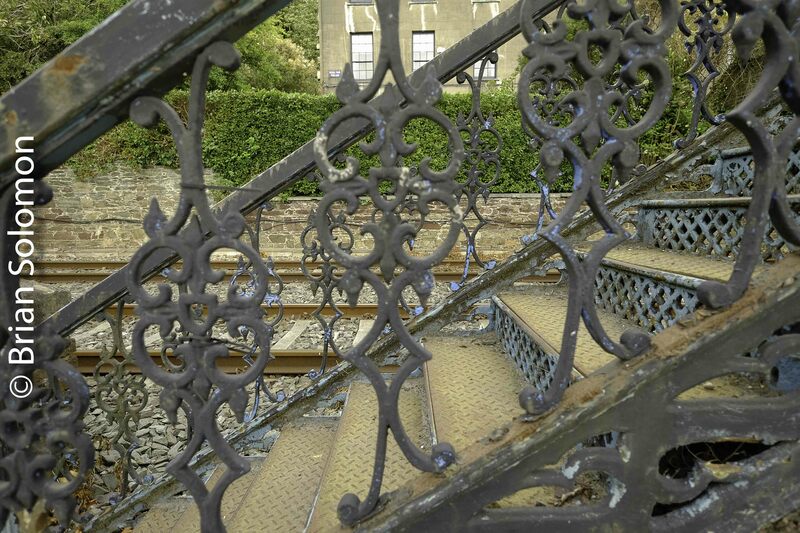 Cast iron foot bridges and terrace houses facing the line make for a classic setting. 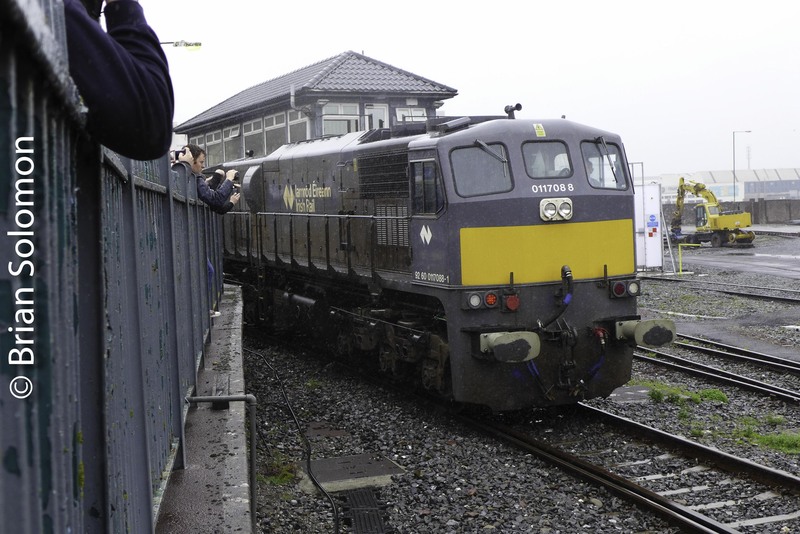 On weekday mornings 2600 railcars pass every few minutes on their way to and from Midleton and Cobh. I made these views using my FujiFilm XT1 during a visit three weeks ago. Yesterday, I had one frame of film left in my Nikon F3. 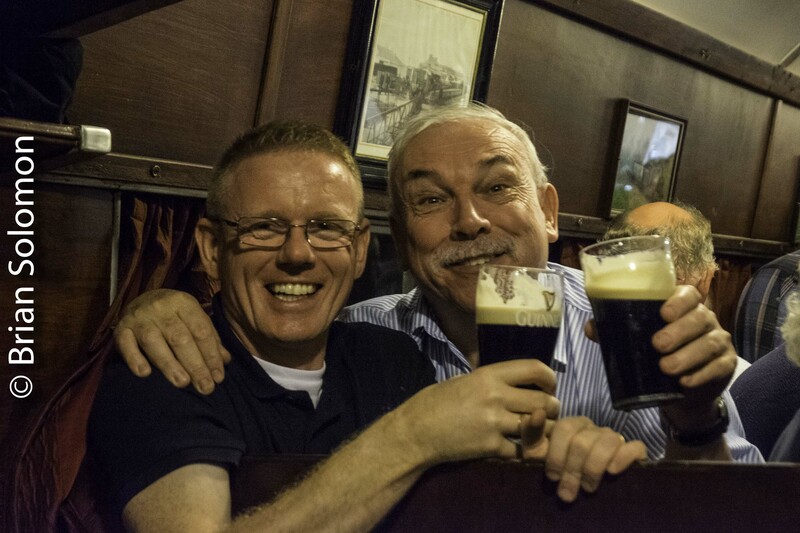 I’d been exposing photos of Dublin’s North Side and I wanted to process the film before dinner. 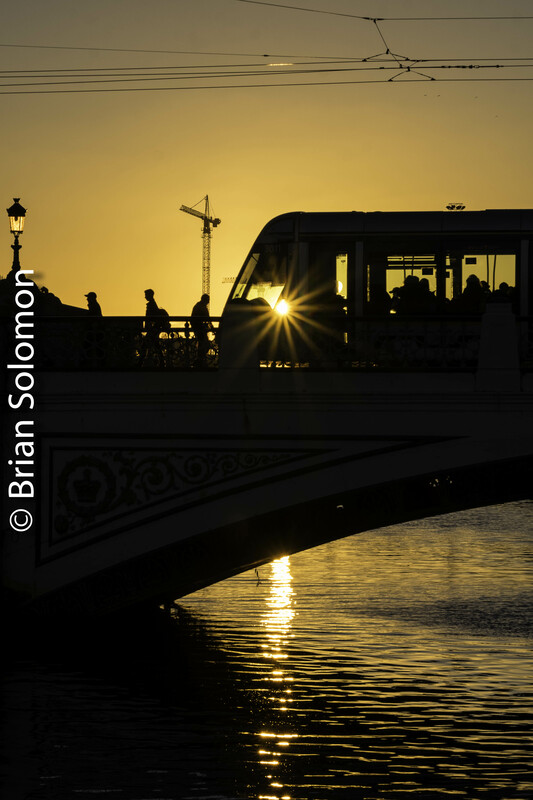 I exposed this view of Heuston Station and the old Kingsbridge (now Sean Heuston Bridge) on frame 37. The sky was impressive; dark blue with textured clouds rolling across it like a flowing tapestry. To make the most of the usual light, I did a few tricky things. I exposed the film for the sky and clouds with the intention of some non-standard chemical processing. To make the most of the shadows with out roasting the highlights, I presoaked the film in a very dilute bath of Kodak HC110 at 75F for 6 minutes with very little agitation. Then, I drained the presoak solution and processed the film in Ilford ID11 mixed 1-1 with water at 68F for 7 minutes (considerably less than the recommended time). The results were even better than I expected. Looking across Dublin’s Croppy’s Park toward Kingsbridge and Heuston Station. Exposed using a 24mm Nikkor lens on an F3 SLR camera loaded with Ilford HP5 black & white film. Processed for maximum dynamic range. 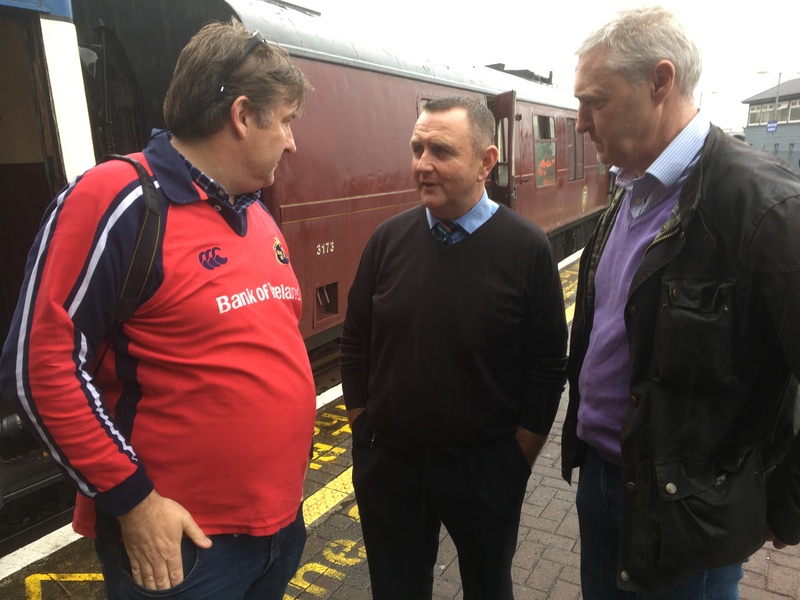 Earlier this month, Ken Fox and I explored railways in County Cork. Rusty autumnal foliage enhanced the pastoral scenery. I made these views using my FujiFilm XT1. By warming the colour temperature I made the most of the season. 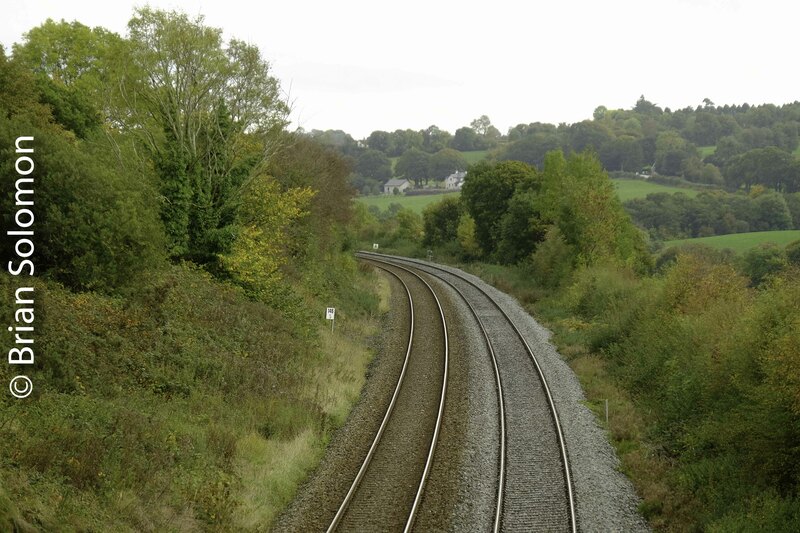 Trailing view of an Irish Rail ICR heading toward Mallow from Kent Station Cork seen near Rathduff, Co. Cork. Looking toward Cork City at Mourne Abbey. 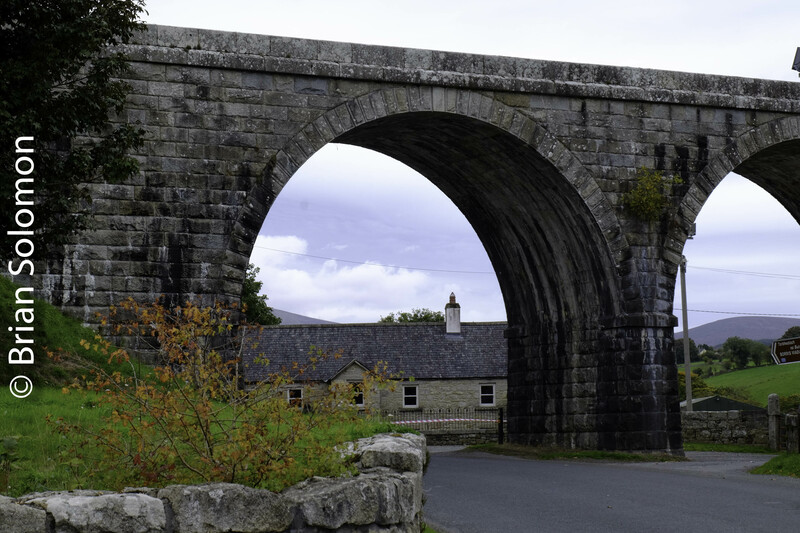 View near Mourne Abbey, October 2018. Irish Rail Mark4 set from Dublin to Cork near Mourne Abbey. 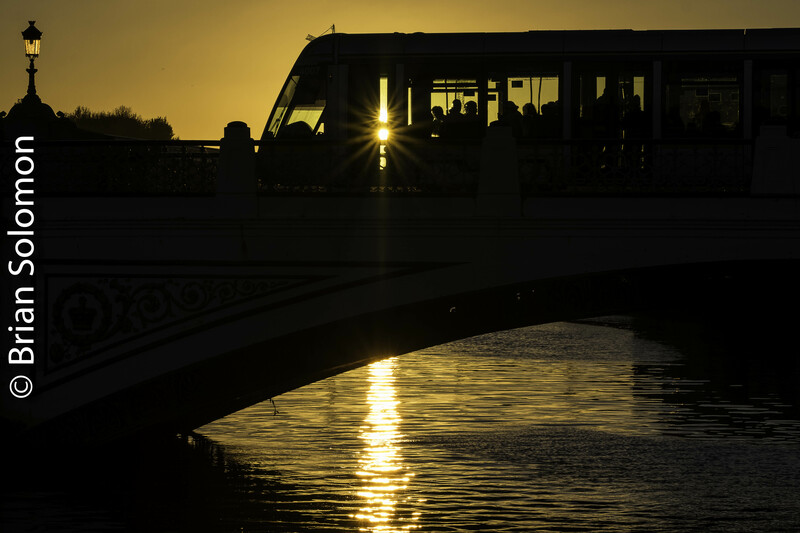 As the sunset on Dublin, Monday a week ago (15 October 2018), I used my FujiFilm X-T1 to expose several series of silhouettes as LUAS trams crossed the old Kingsbridge (now formally Sean Heuston Bridge) over the River Liffey. This 27mm view captures the whole scene. 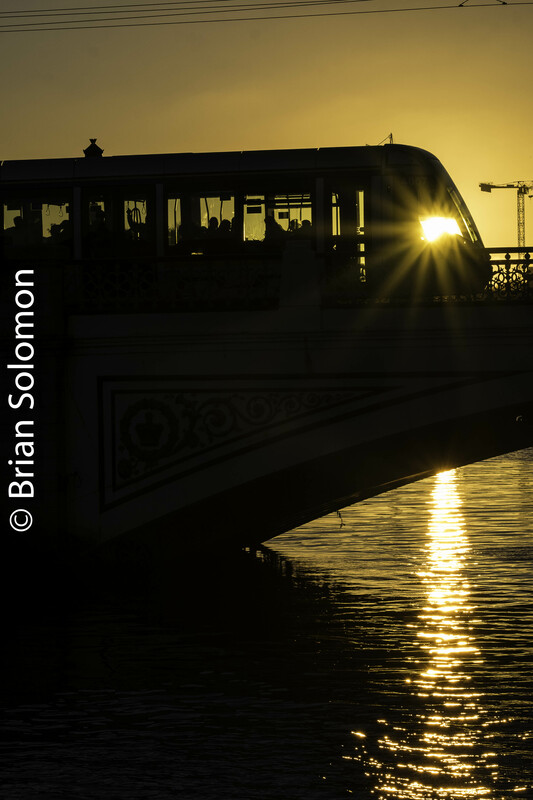 By contrast, the telephoto (90mm) views are more tightly focused on the tram and arch of the bridge. My goal was to capture the rays of sun bursting through the windows of the tram cars. 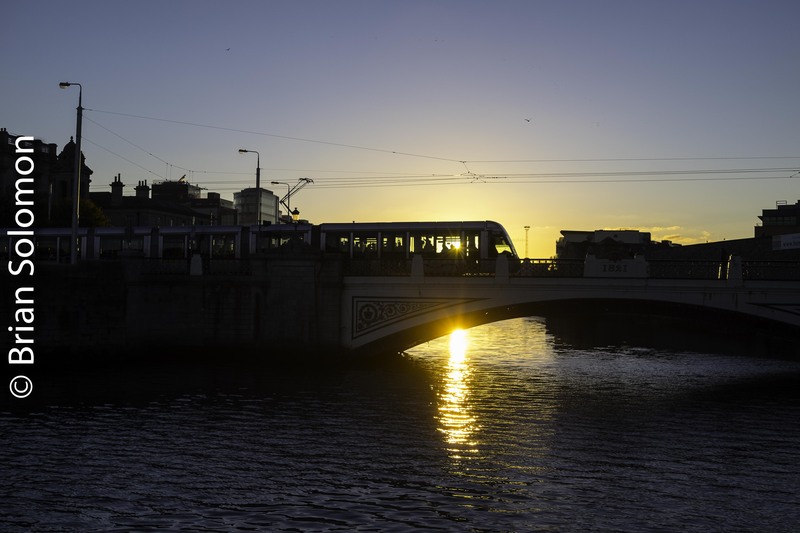 I only had a few minutes where the sun was in the optimal position, and luckily LUAS was operating trams on short headways, so I had several opportunities. My camera was set for ‘turbo flutter’ (continuous high or ‘ch’ on the left-hand dial) which exposes a rapid burst of images when pressing the shutter button. This is my favorite of the more than three dozen exposures I made. By exposing for the sky and sun, I allowed the shadows to become an inky black. Using the smallest aperture (f22 on my 90mm lens) creates the sunburst effect while also allowing for better definition of the sun in the sky. On this day 31 years ago: Genesee & Wyoming 45. On the evening of October 23, 1987, I exposed this Kodachrome 25 slide using my Leica M2 with 50mm Summicron lens. Today Genesee & Wyoming is a name associated with more than 110 short line and freight operators in North America, Europe and Australia. In 1987, the original Genesee & Wyoming Railroad was a New York State short line that had only recently begun to extend its arms. 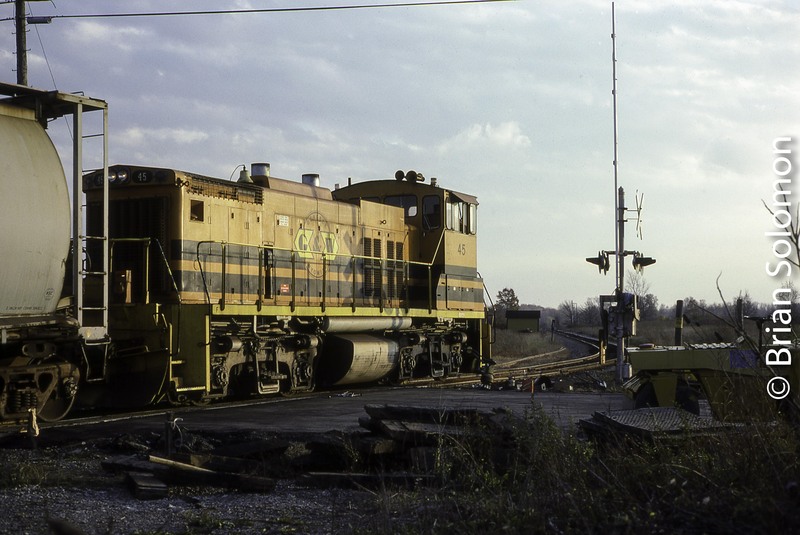 Genesee & Wyoming MP15 number 45 works south from P&L Junction in Caledonia, New York on the evening of October 23, 1987. 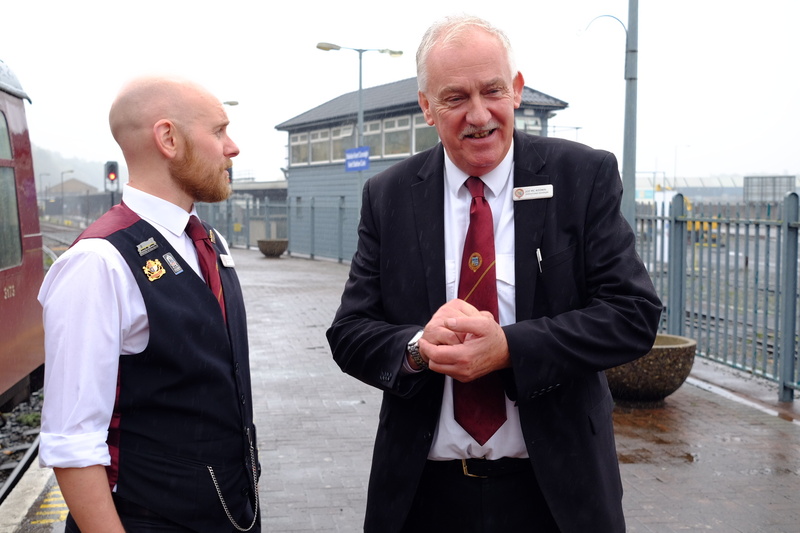 Variety and Colour at Howth Junction in Eight Views—October 2018. 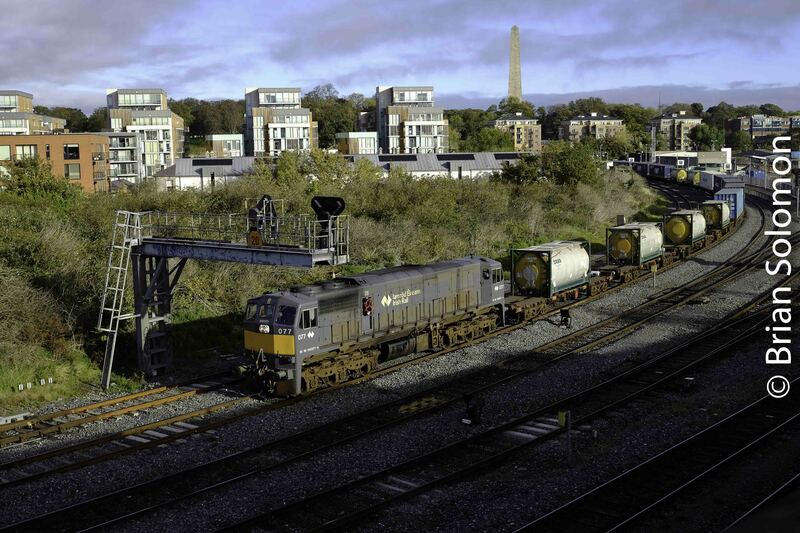 Howth Junction is a double junction (two running lines) where the Howth Branch diverges from the Dublin-Belfast main line. 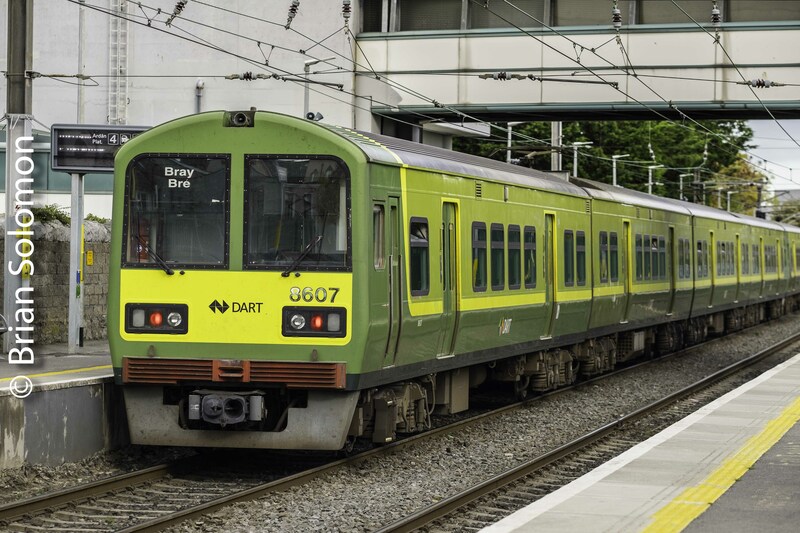 Both routes are electrified for DART (Dublin Area Rapid Transit) services. 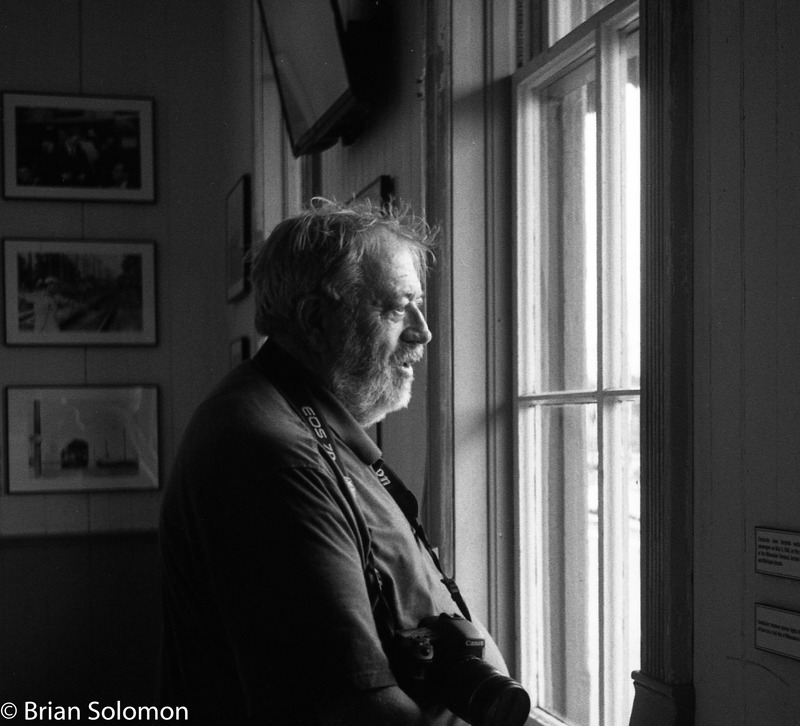 I made these views digitally using my FujiFilm X-T1 on a visit with Jay Monaghan last week. 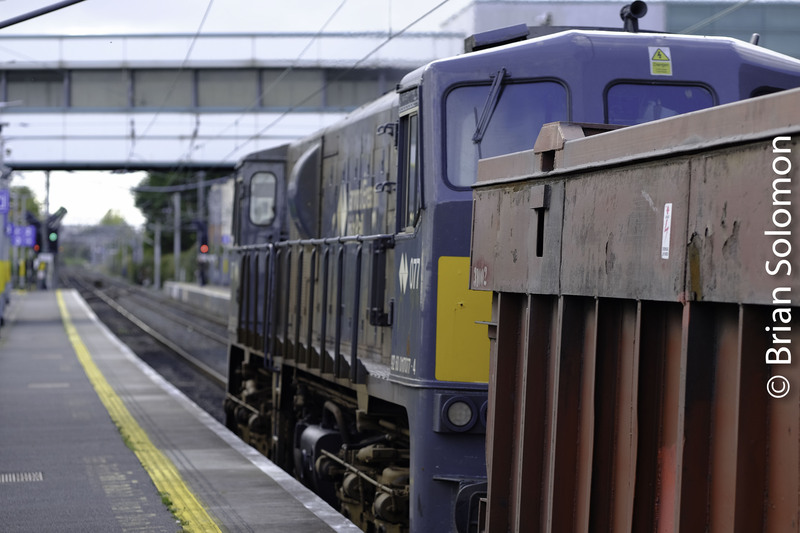 In addition to DART electric trains, I made photos of Irish Rail diesel suburban services, the Dublin-Belfast Enterpriselong distance train, and a laden Tara Mines zinc freight. Some autumn foliage near the junction made the location more colourful. 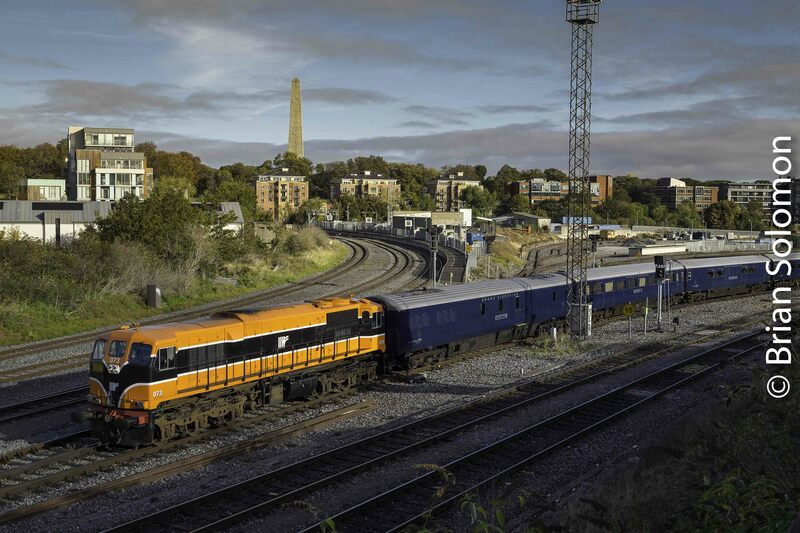 Dublin bound DART departs Howth Junction. 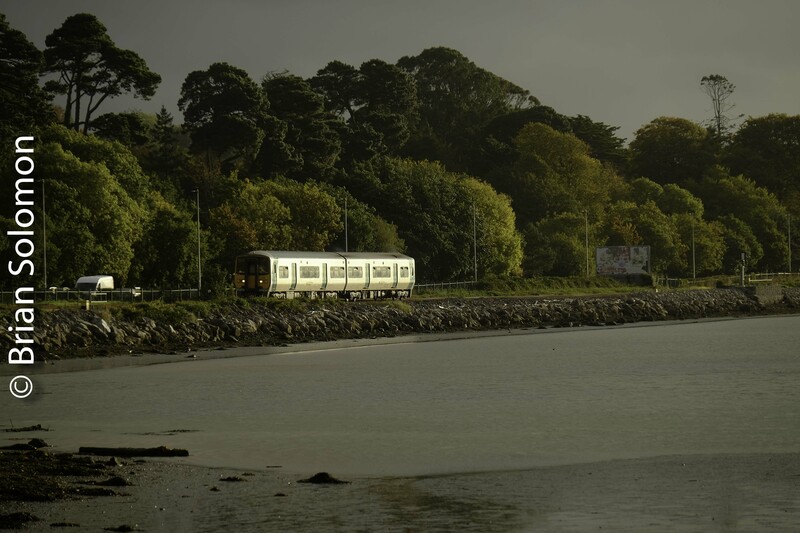 A DART train from Howth enters the main line. DART is now scheduled on ten minute intervals. 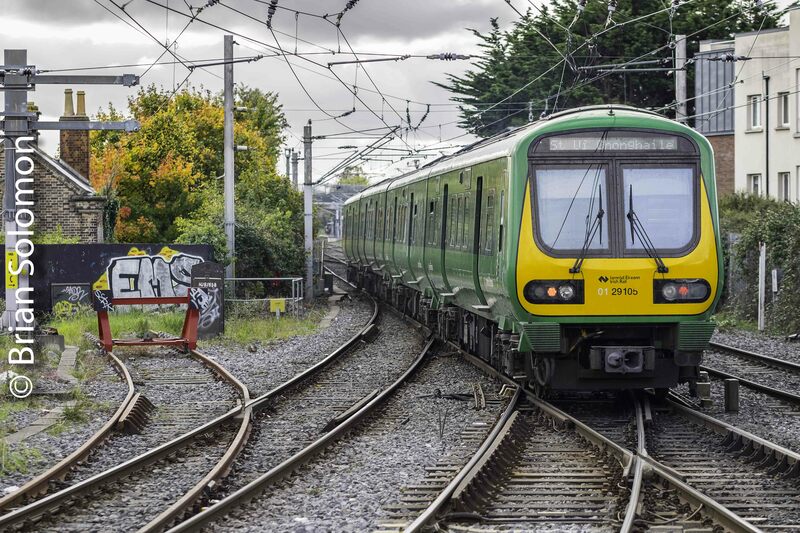 Malahide bound DART approaching the down platforms. 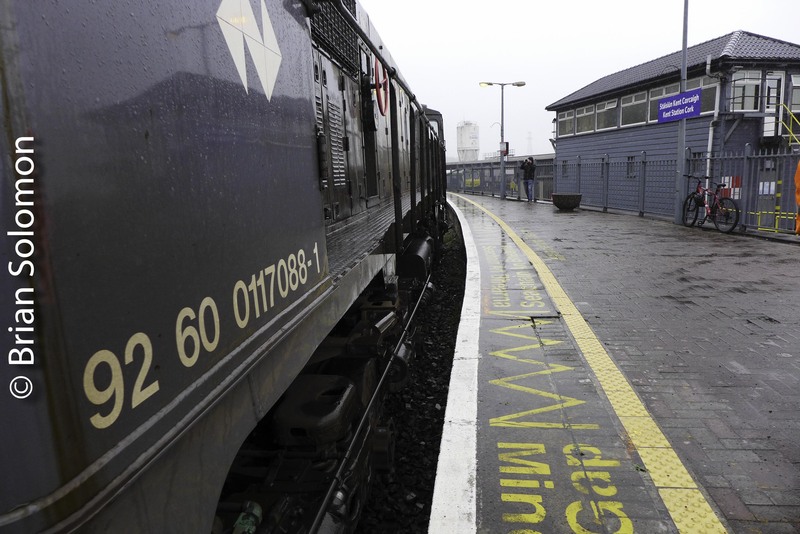 The same train as above paused at the platforms for passengers. 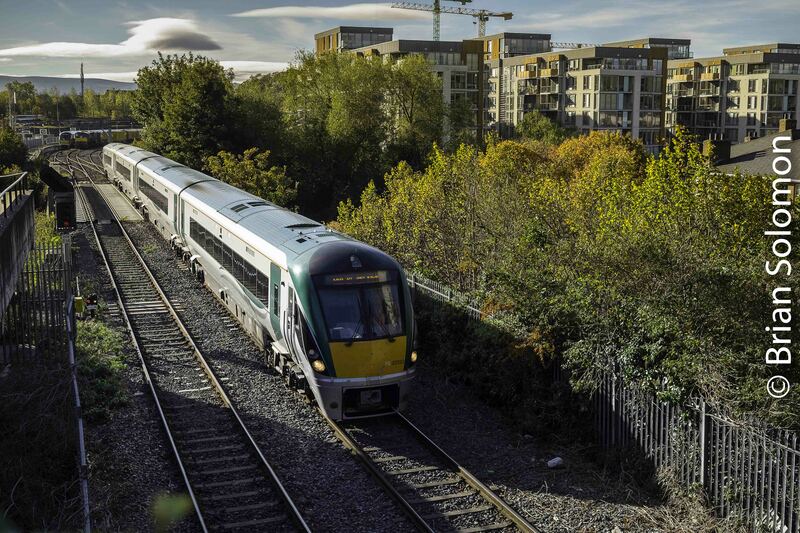 The Belfast bound Enterprise doesn’t stop for passengers at Howth Junction. 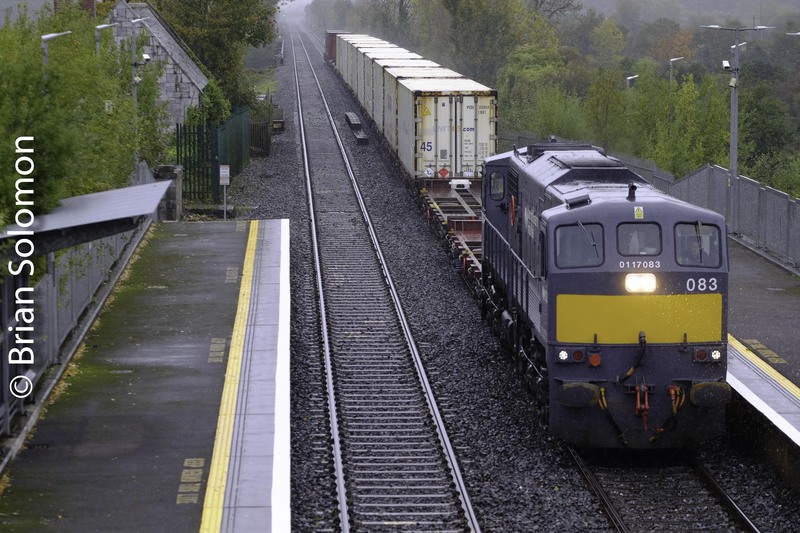 Irish Rail 077 leads the laden Tara Mines run toward Dublin port. 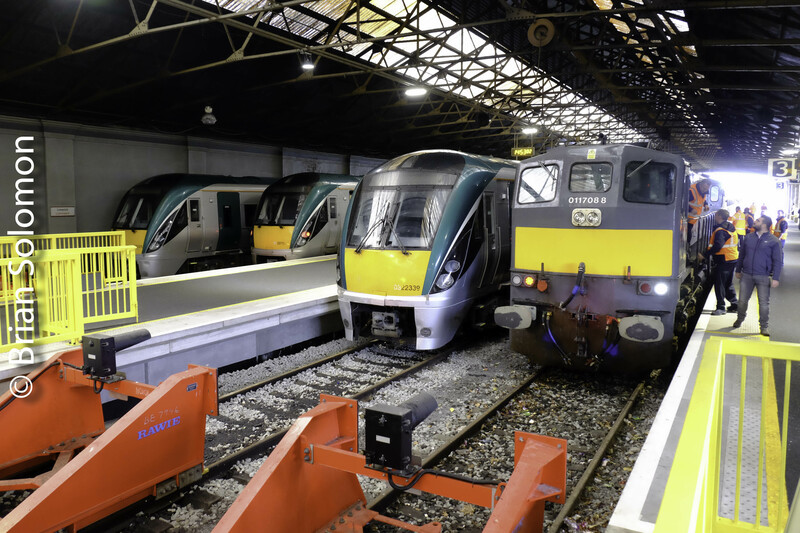 Irish Rail 29000-series CAF built diesel railcars head toward Dublin. I went to the Shops and Scored Three Cool Trains! Yesterday was a bright sunny morning in Dublin. 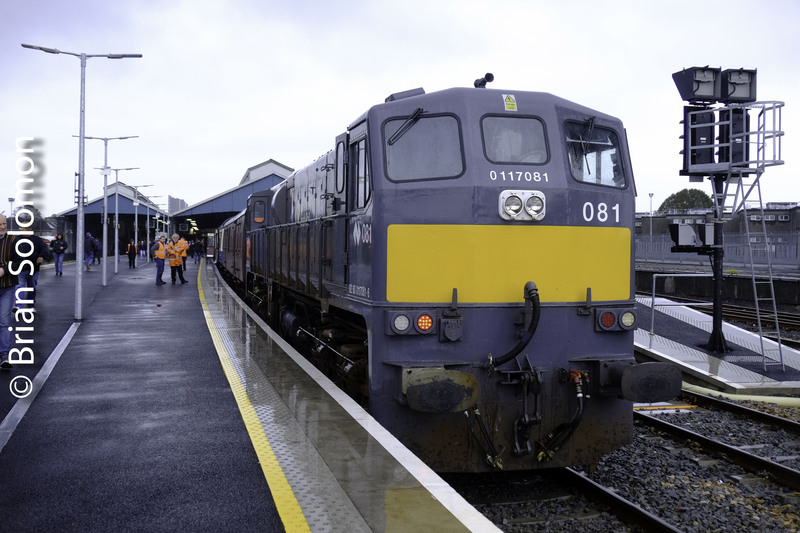 I coordinated my walk to SuperValu at Heuston South Quarter to neatly coincide with the passage of Irish Rail’s IWT Liner. I timed this well and only waited a few minutes at Islandbridge Junction. Rather than my normal angle from ‘the box’, I opted for an over the wall view a little further up. 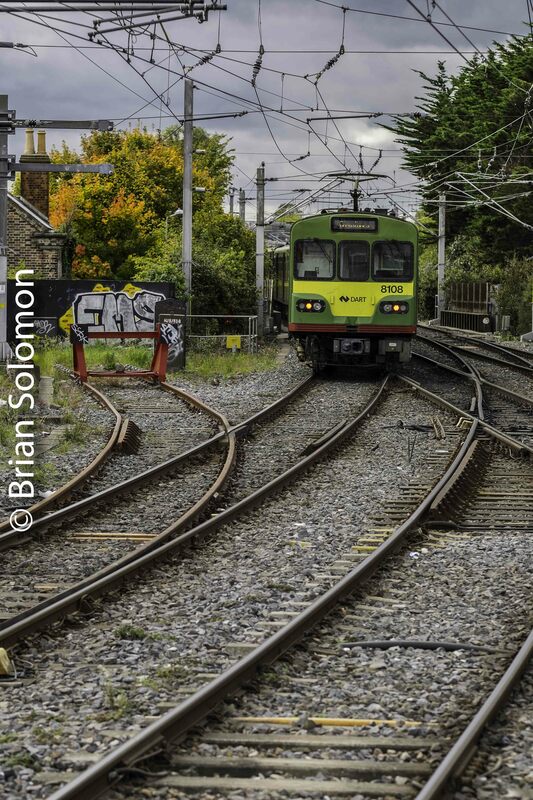 Irish Rail 077 leads the down IWT Liner at Islandbridge Junction. Continuing along St. John’s Road toward Dublin Heuston Station, I was surprised to hear another 071. I peered over the wall to discover that Irish Rail 073 (in heritage orange paint) had come down to shunt Belmond’s Grand Hibernian. 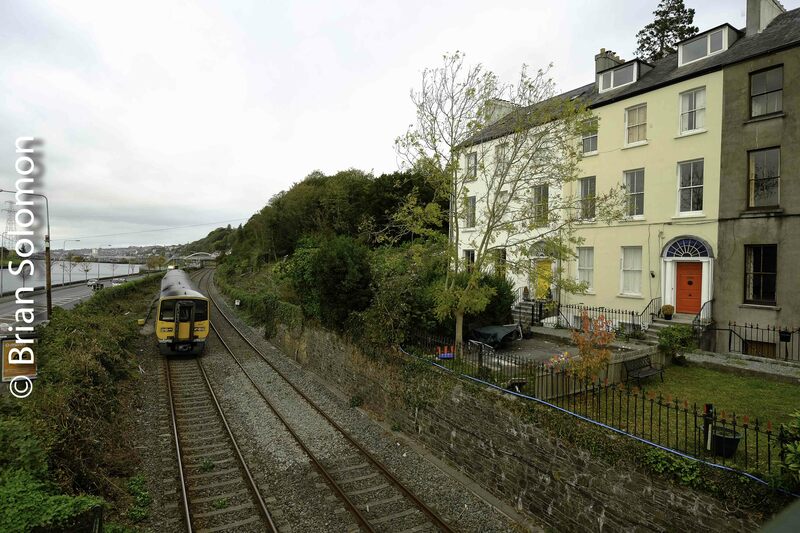 Hearing the distinct sounds of an EMD turbocharged 645 diesel tempted me to look over the wall as I walked along the St Johns Road toward Supervalu. 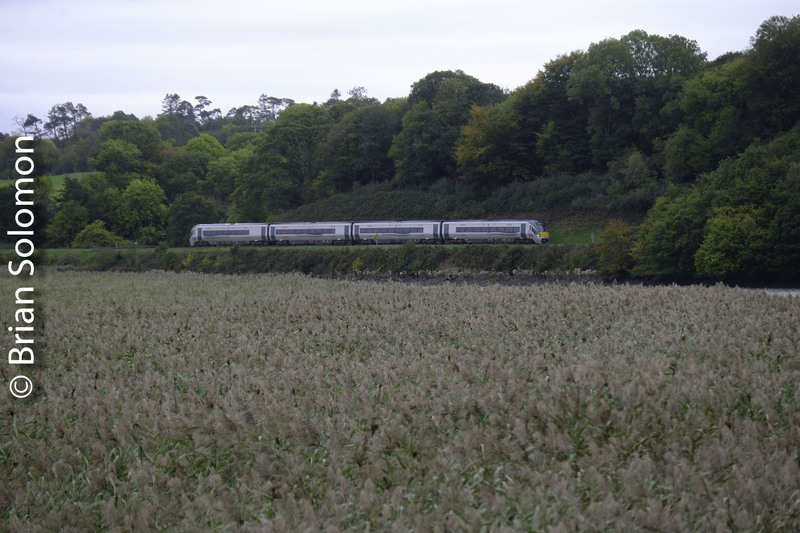 This is what I saw; Irish Rail 073 moving down to shunt the Belmond cruise train. 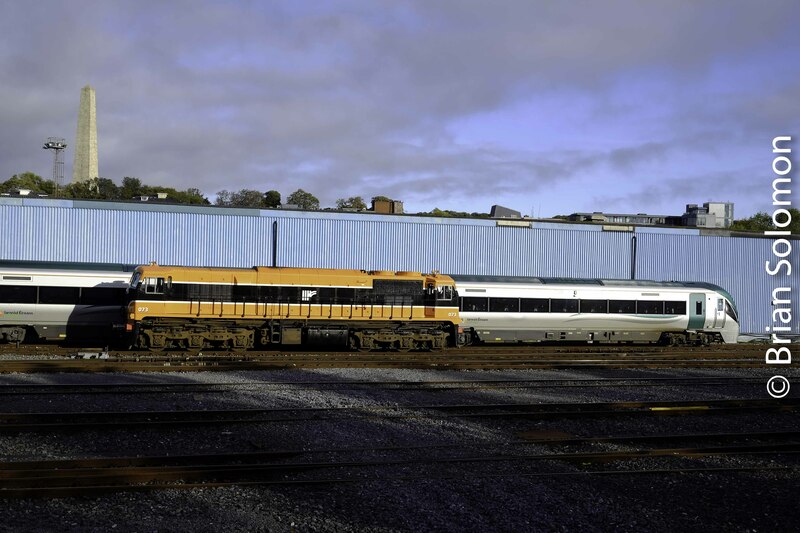 An ICR (InterCity Railcar) sits by the valeting plant. 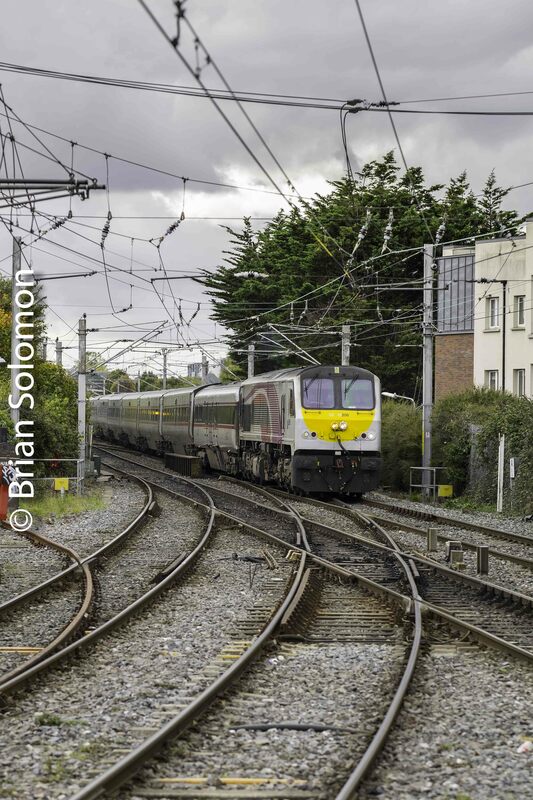 Walking back from SuperValu, I made this view of 073 shunting Belmond’s Grand Hibernian consist. 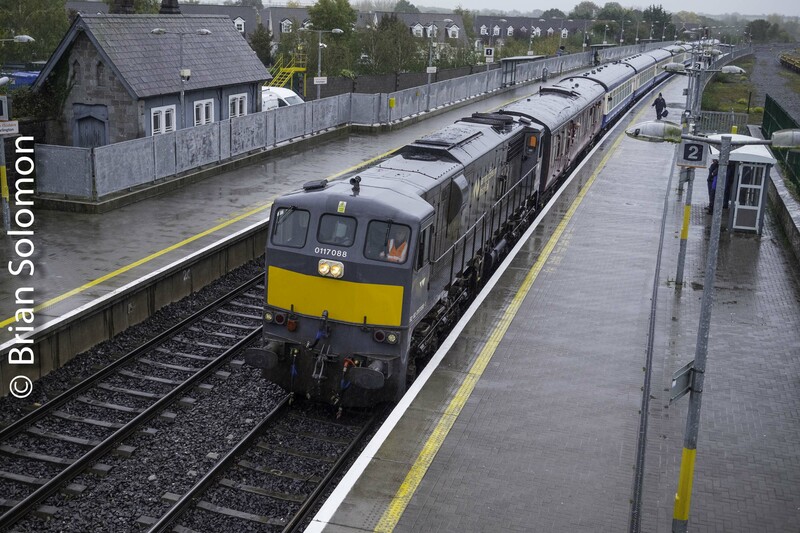 Dashing to SuperValu, accomplished my shopping in record time, and returned trackside to catch 073 bringing the Grand Hibernianthrough the wash, and then stopped in front of me at Islandbridge Junction. As this was happening Paul Maguire sent me text to alert me that the elusive Sperry train was on its way over to me. The view from the box of 073 shunting the Belmond train through the carriage wash. I’ve made slight enhancements to the image to make the most of the dramatic autumnal sky and lighten shadows. 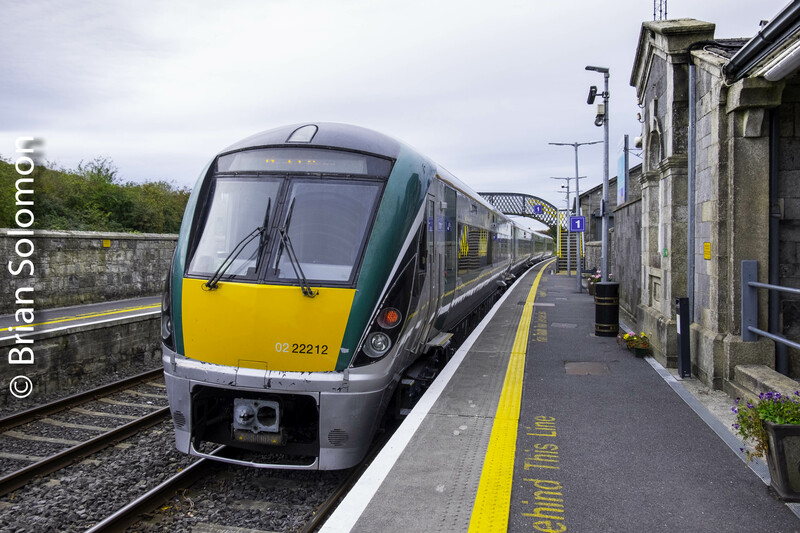 Minutes later, Irish Rail 076 with Sperry came across to Platform 10 where it was scheduled to run around before heading to Bray. 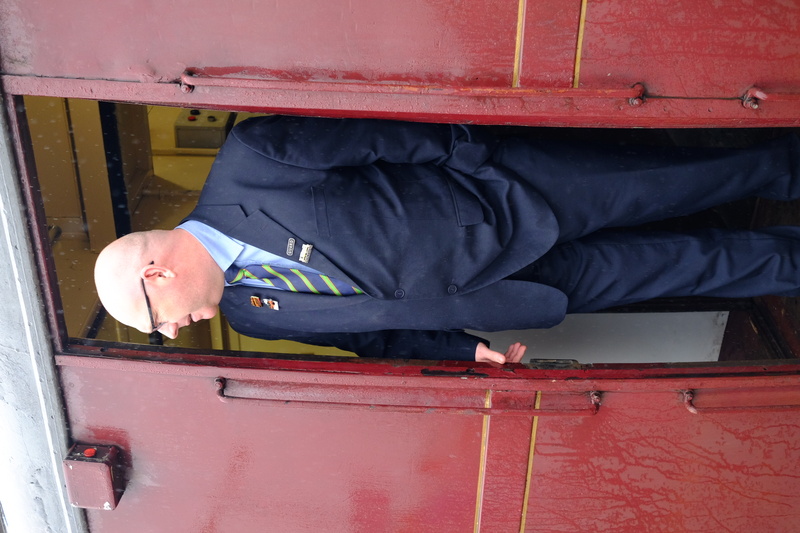 Blocked by the Belmond! When one cool train gets in the way of another. Yet, the two trains together are the real story. I can’t say that previously I’d ever photographed the Belmond and Sperry train at the same time. 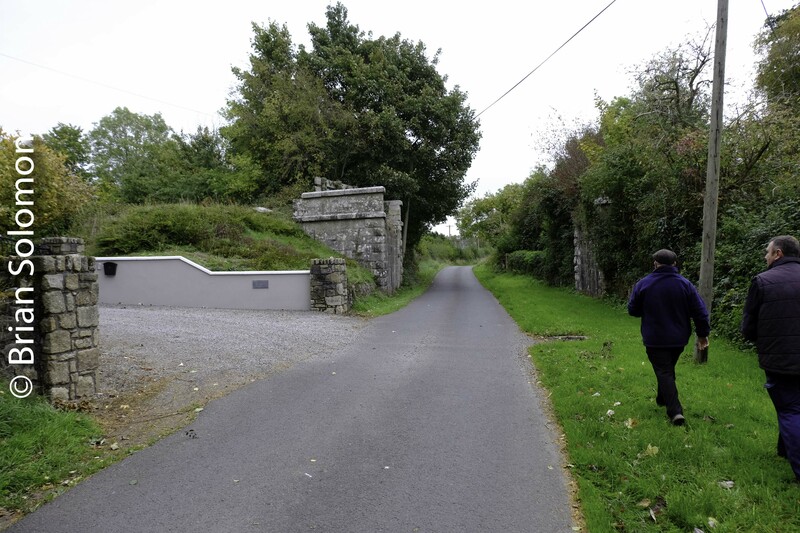 I walked around to Conyngham Road to catch the Sperry train on its way into the Phoenix Park Tunnel. Not bad for a trip to the shops! 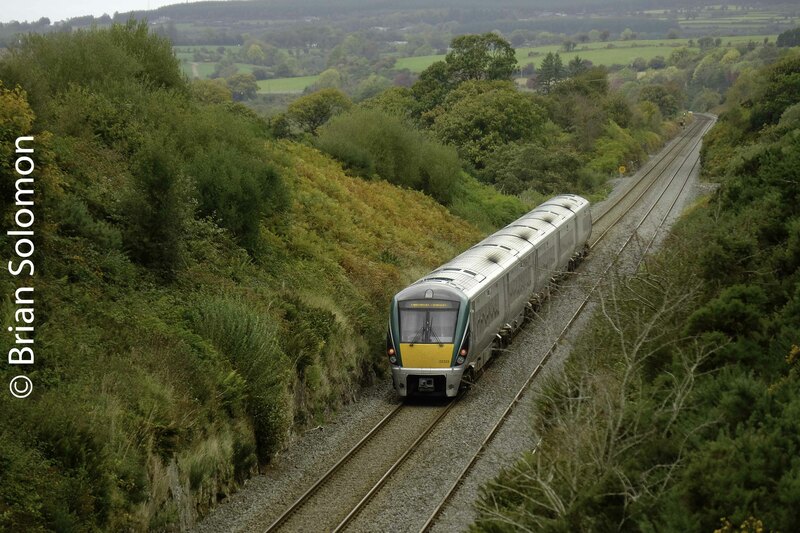 An Irish Rail ICR is working toward Connolly Station as viewed from the Conyngham Road. 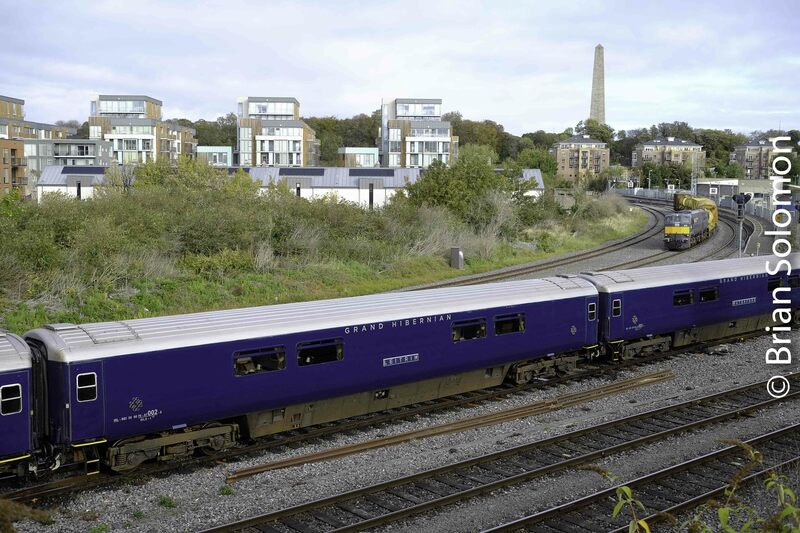 In the distance is the Sperry train opposite Platform 10 at Heuston Station. 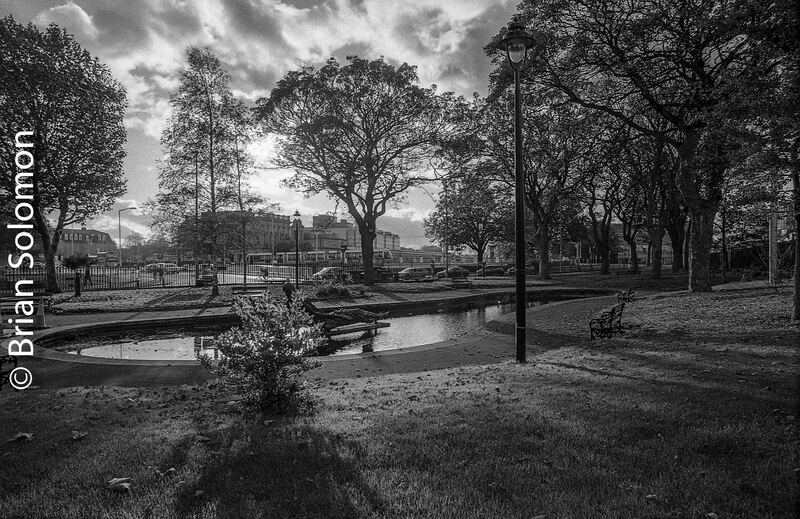 I’ve made slight enhancements to the image to make the most of the dramatic autumnal sky and lighten shadows. 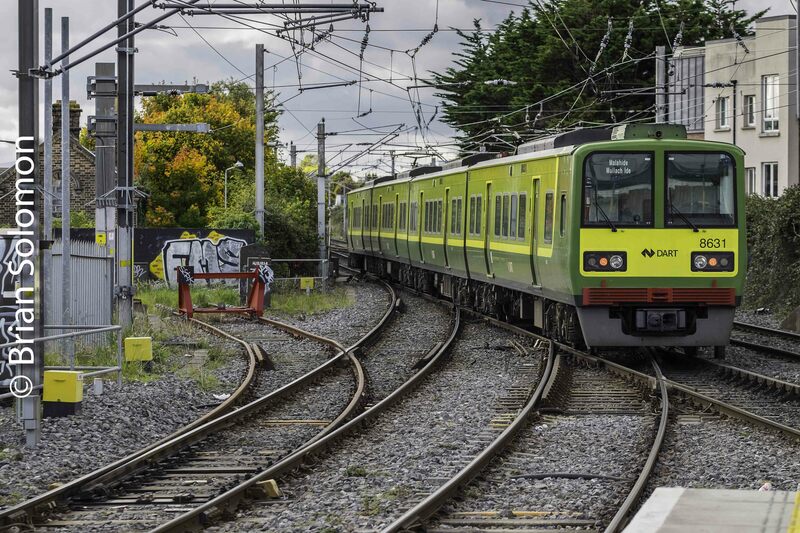 Irish Rail 076 throttles up as it leads the Sperry rail testing train into the Phoenix Park tunnel. I’ve made slight enhancements to the image to make the most of the dramatic autumnal sky and lighten shadows. Monochrome at Mallow—13 October 2018. 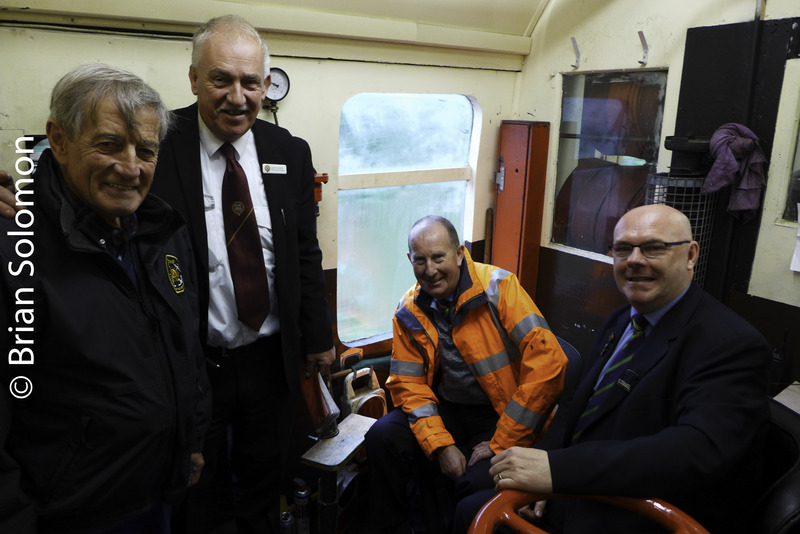 More monochrome film photos: Railway Preservation Society of Ireland’s autumn tour at Mallow, County Cork last Saturday. 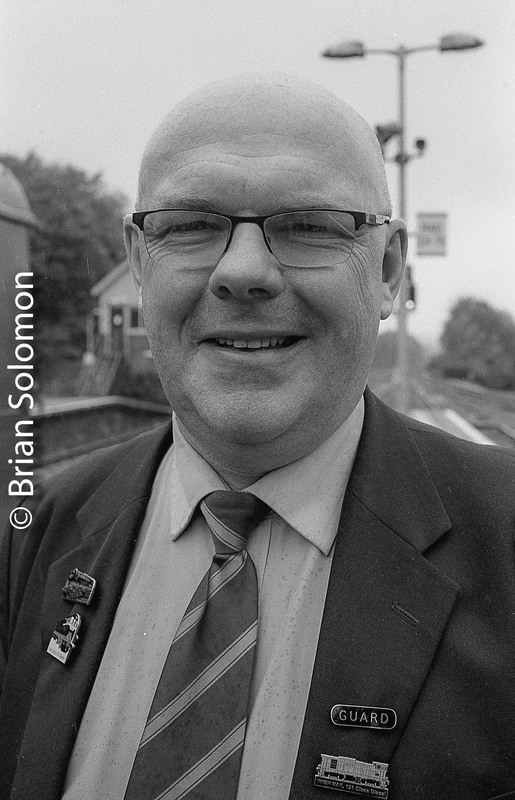 These were exposed on Kodak Tri-X using my Canon EOS-3 with 40mm pancake lens and processed in Ilford ID11 developer. 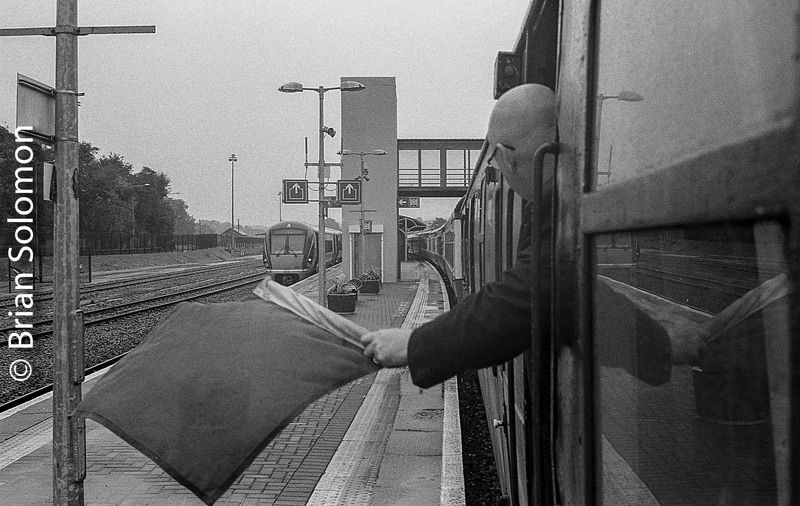 Black & white film is well suited to making atmospheric images on dull days. 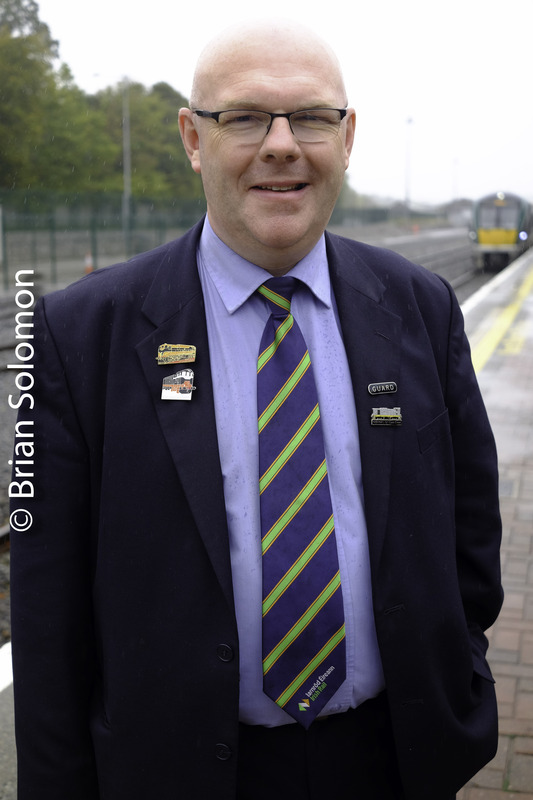 Irish Rail’s Noel Enright at Mallow, Co. Cork. 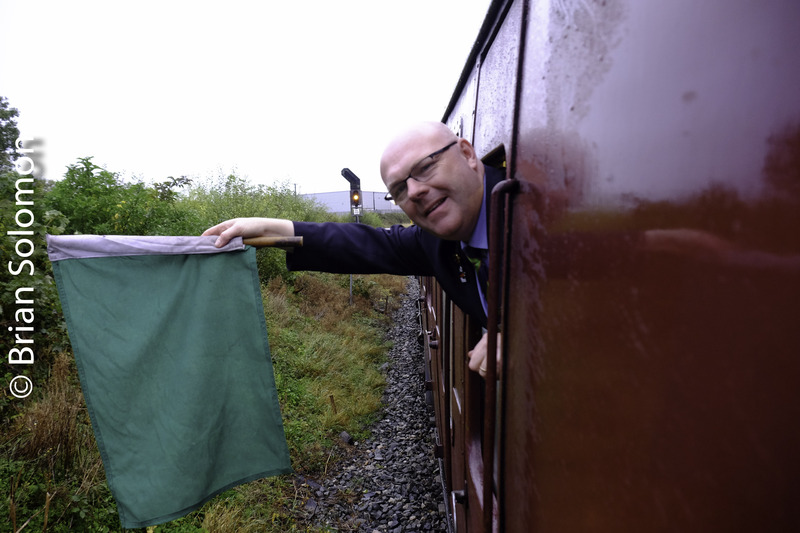 Irish Rail’s Noel Enright gives the green flag at Mallow, Co. Cork. Tracking the Light posts everyday and sometimes twice! 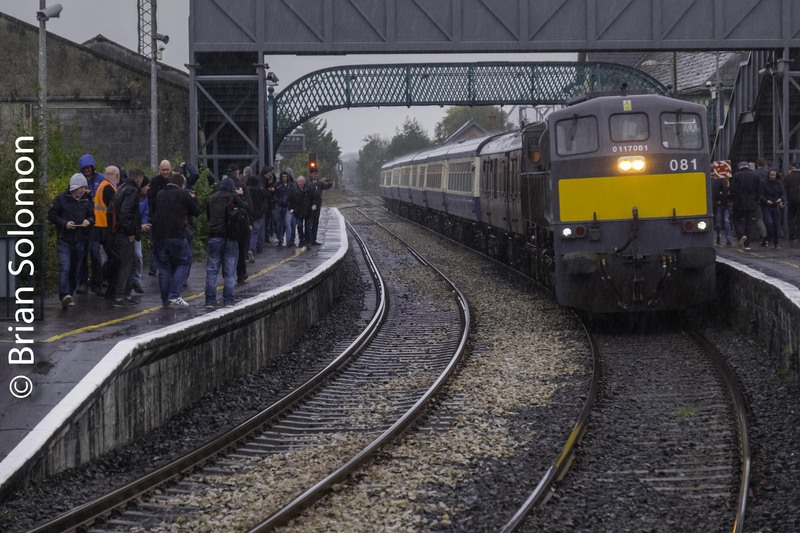 One Week Ago: RPSI Special Rolls through Cork’s Kent Station. 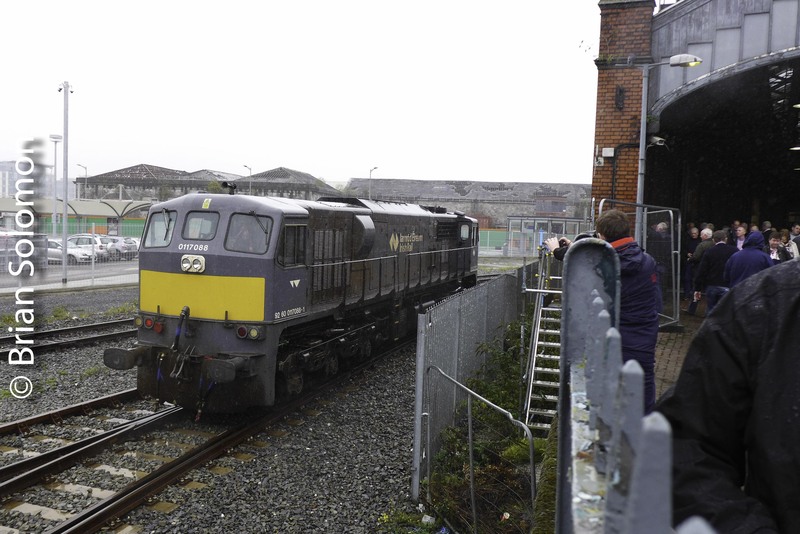 This day last week (13 October 2018), I traveled on and photographed Railway Preservation Society of Ireland’s autumn diesel tour called The Southwestern. Damp dark weather may make it difficult to expose over the shoulder lit three quarter views, and it may ruin Lumixes (See: Final Frame? 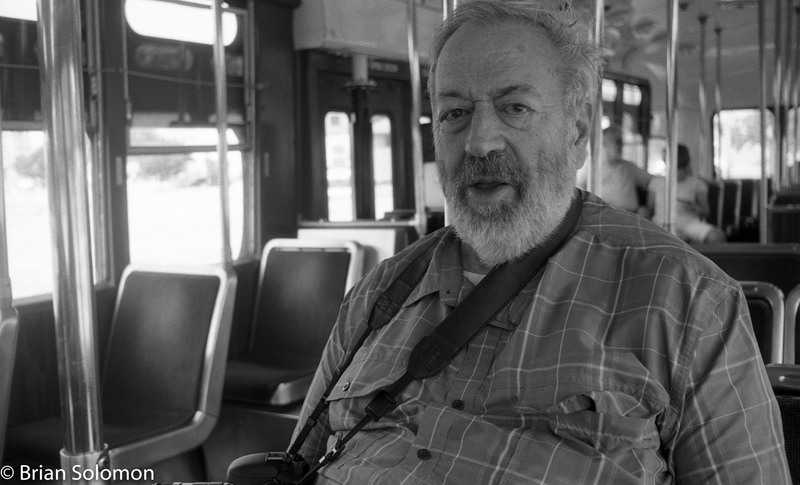 Lumix LX7 Coils Up), but it’s ideal for making black & white photos on film. Working with my battle-worn Canon EOS-3 with a 40mm pancake lens, I exposed this view of the train at Cork’s Kent Station using Kodak Tri-X. On Monday, I processed the film using Ilford ID11 mixed 1-1 with water. Following a presoak with exceptionally dilute HC110 to initiate development, I gave the film 7 minutes and 30 seconds in the ID11 at 68F (20C) with intermittent agitation. I scanned the negatives using an Epson V500 flatbed scanner and made nominal contrast adjustments using Lightroom. 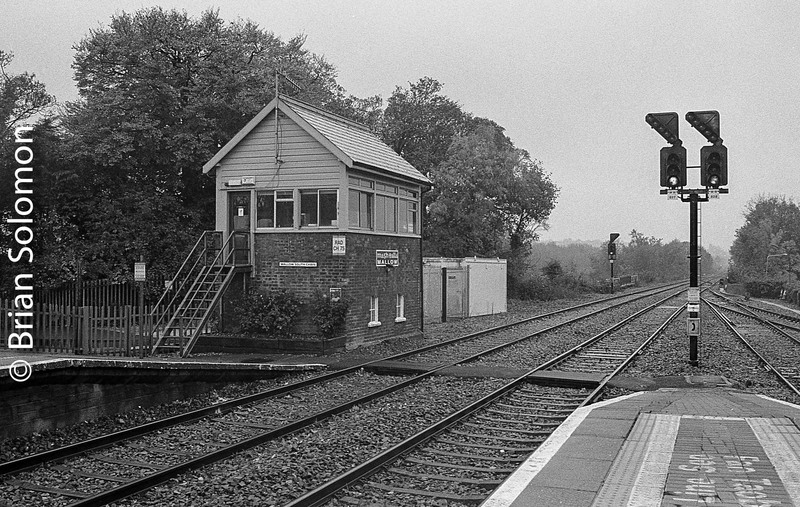 Kodak Tri-X view of Cork’s Kent Station on 13 October 2018. More monochrome images to follow! 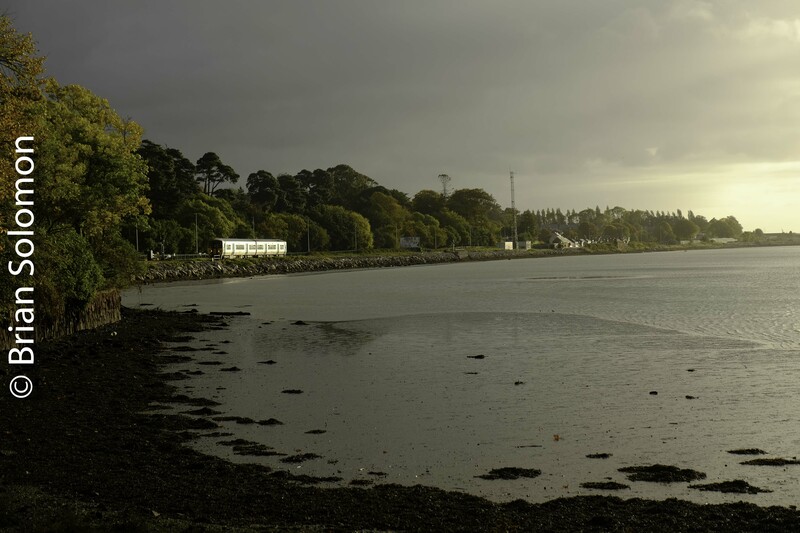 Glounthaune Sunrise—Cobh Junction Glint in 3 photos. 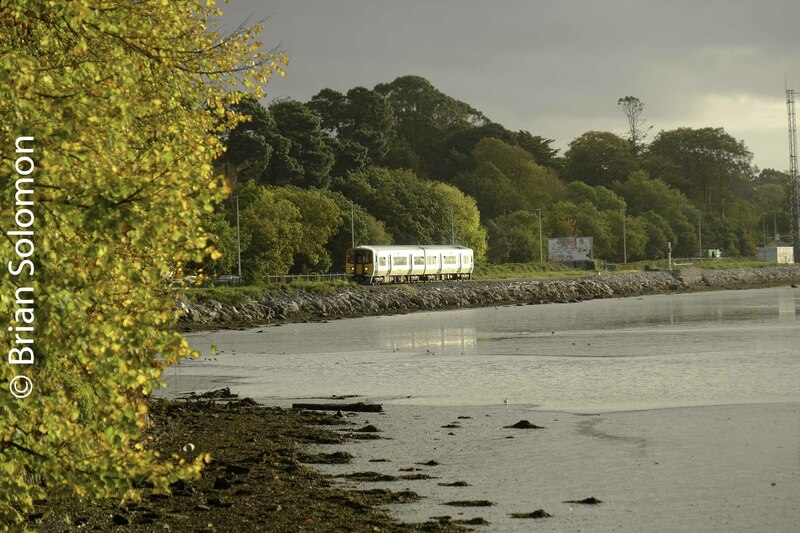 Last week on a visit to Cork, I made these views of Irish Rail’s 2600 railcars working Cork-Cobh and Cork-Midleton services from Glounthaune village looking across the water toward Glounthaune/Cobh Junction station. I was working with my FujiFilm XT1 and Canon EOS-3 cameras. The Canon was loaded with Provia 100F, and we’ll have to wait for the slides to be processed. Regular Tracking the Light readers know that I often favor low-light ‘glint’. This is tricky light to expose satisfactorily. It is a matter of getting the balance between highlights and shadows right, which is a subjective decision on the part of the photographer. 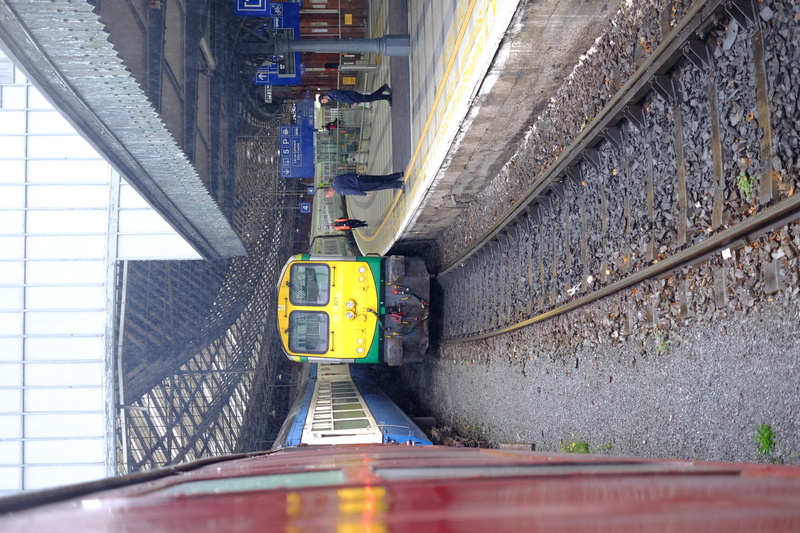 Irish Rail 226 and its Great Southern & Western Railway Commemorative Plate. 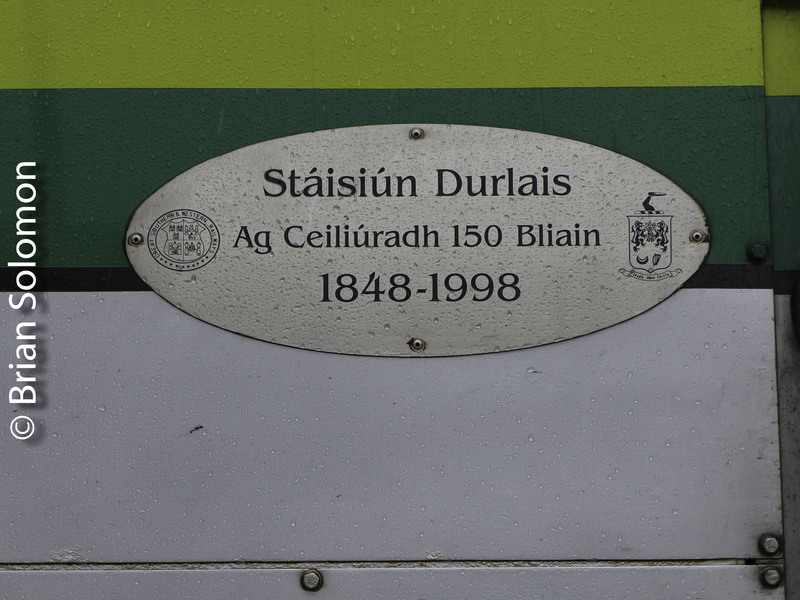 Irish Rail 226 is unique because of commemorative plate(s) it carries on the sides of the locomotive. Here’s a selection of digital photos I exposed of 226 at Portarlington on 13 October 2018. Irish Rail 226’s commemorative plate. A dreary morning at Portarlington. Lumix LX7 photo. Lumix LX7 photo on 13 October, 2018. A few hours later this camera failed. Thankfully, I have others to work with. Sometimes a detailed photograph says more than an overall view. What do you think? 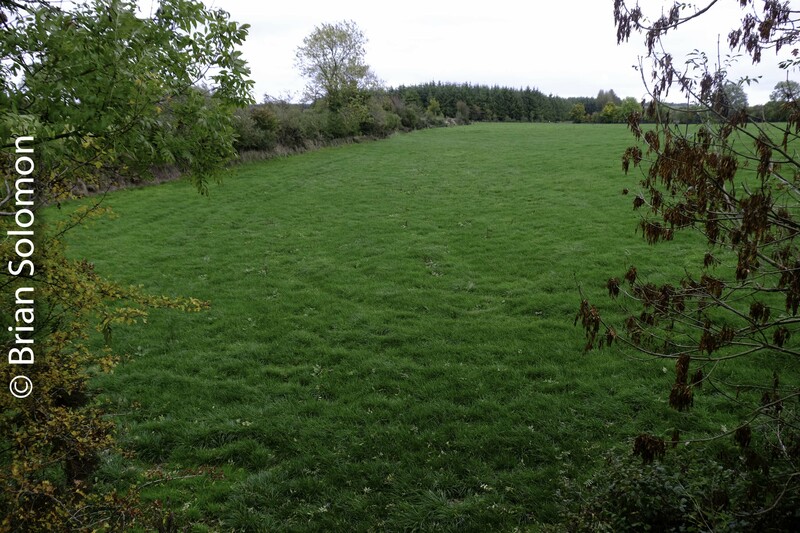 Rails along the River Slaney—Killurin, County Wexford. 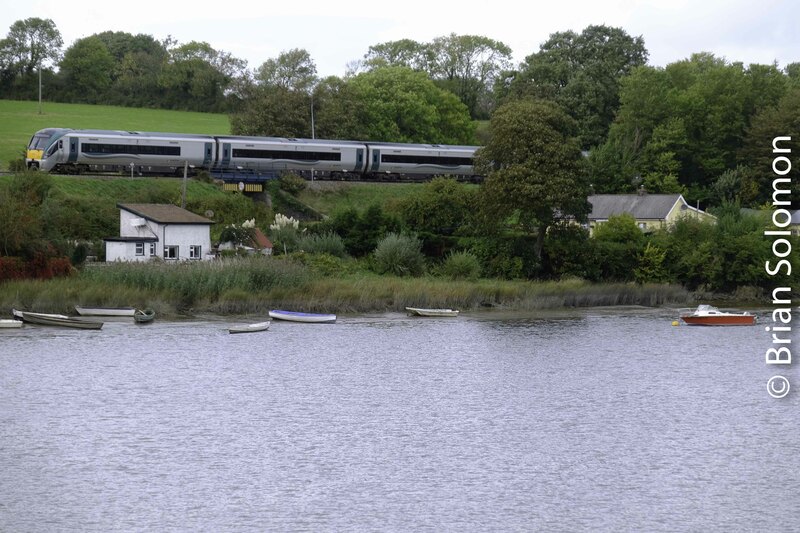 Irish Rail’s line from Dublin to Rosslare hugs the River Slaney north of Wexford town. 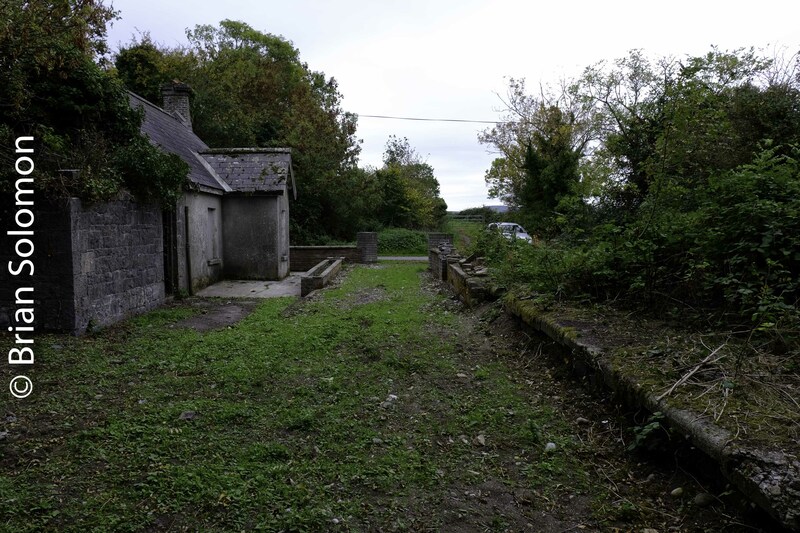 On our exploration of disused lines in county Wexford, Ken Fox, Donncha Cronin and I made a short detour to photography the ‘Up-Rosslare’ at Killurin as it ran along the west bank of the Slaney. This is a pretty part of the line, and a place I hadn’t explored in almost a decade. The last time I’d made a photo here, it was a 141-class diesel hauling the then ‘new’ weedsprayer. That wasn’t yesterday! 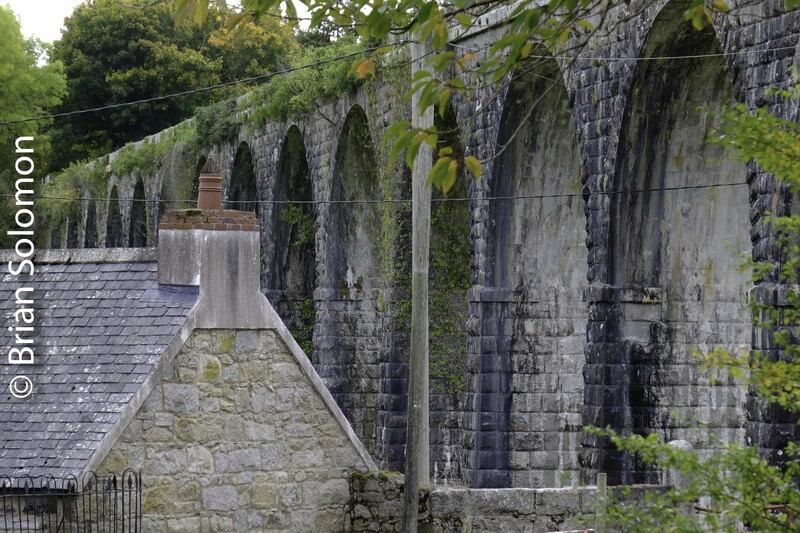 From the Slaney bridge at Killurin. This trailing view reminds me of Maine Central’s Rockland Branch. These images were made with my FujiFilm XT1 with 18-135mm zoom, files adjusted for contrast and exposure in Lightroom. 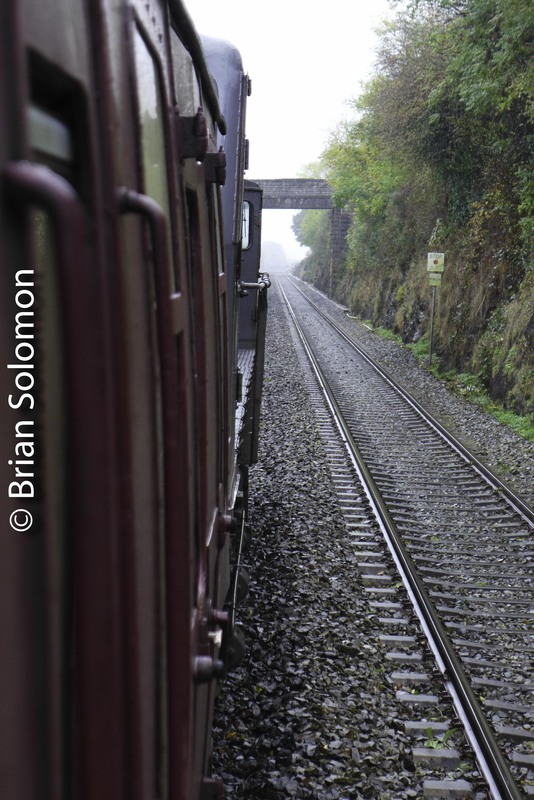 Railway Preservation Society Ireland—Fall Tour: Ten Lumix Views. Despite its failure on the day of the tour, I’d made good use of the camera right up to the end. This versatile picture making device had been a staple of my camera bag for more than four years. 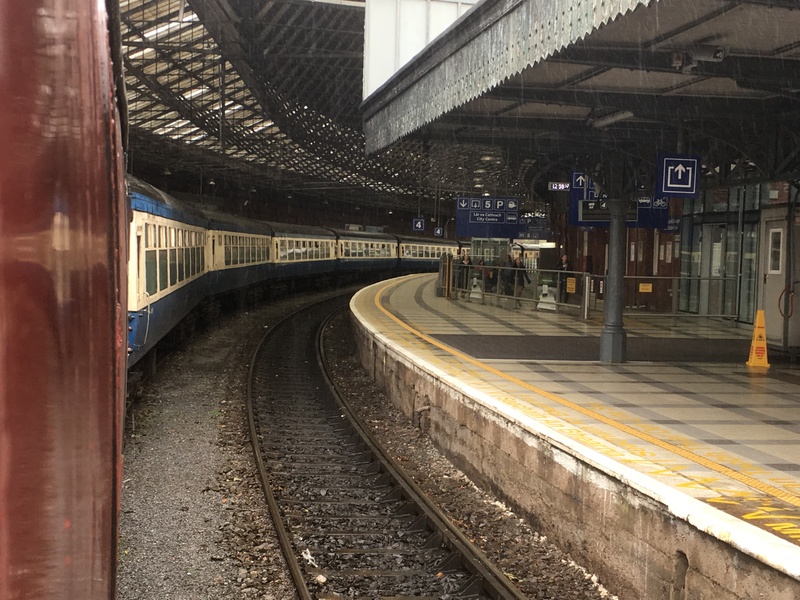 Below are a selection of photos from Saturday 13 October 2018 of RPSI’s The Southwestern rail tour that operated from Dublin Connolly to Cork, then via Limerick, Ennis and Athenry and back to Dublin. 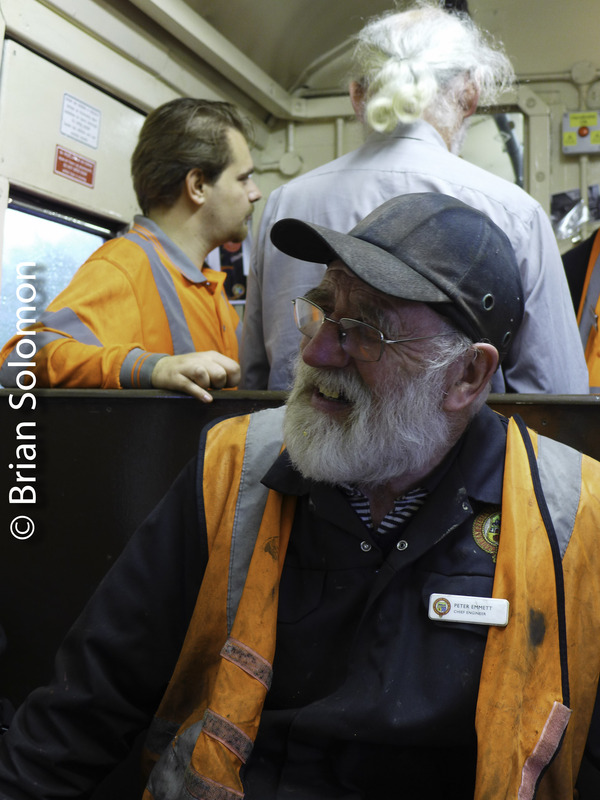 On these rail tours I tend to focus on the people as much as the equipment. Tracking the Light Publishes Daily. Final Frame? Lumix LX7 Coils Up. That’s a phrase that means ‘failed in service’. In recent days, my faithful Lumix LX7 that I bought in June 2014 had developed quirky, unreliable traits. 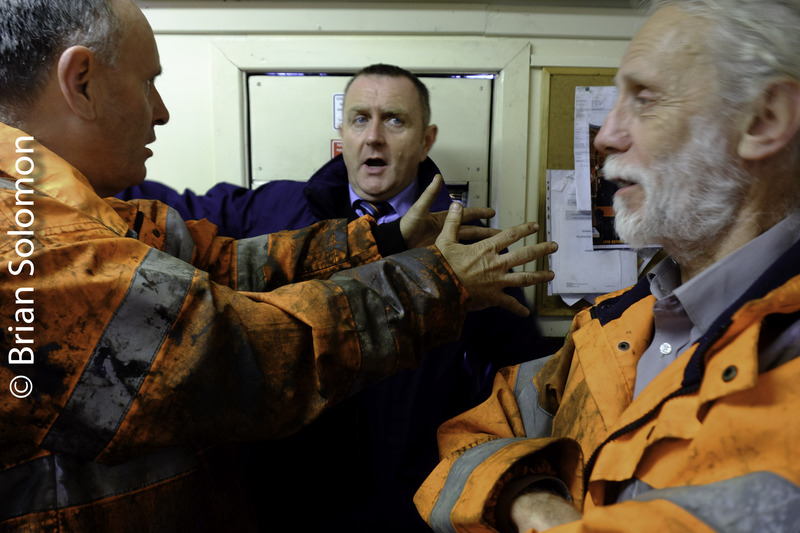 Machines, including cameras shouldn’t develop irritable personalities. It’s an indication that the machine is broken. On Saturday, 13 October 2018 the camera exhibited symptoms of failure. The weather had been exceptionally wet for two days in a row, and dampness is bad for electronics. 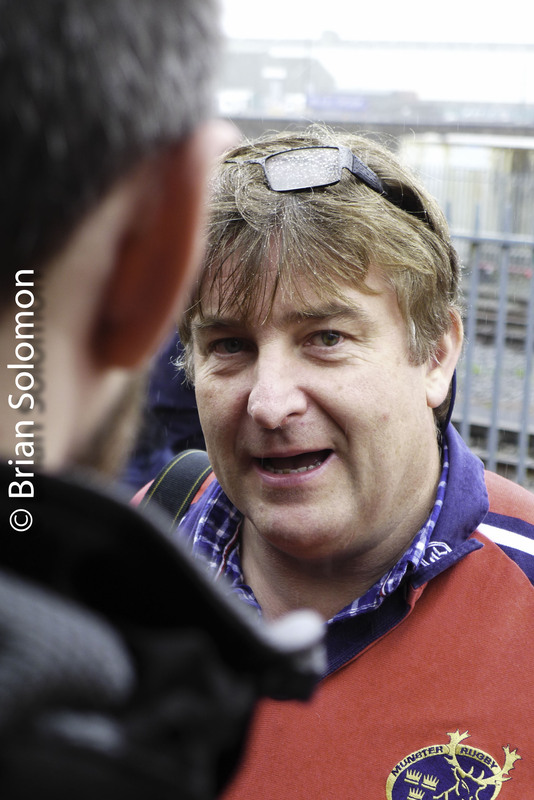 I made two images of Irish Rail 088 running around at Kent Station, Cork using LX7. Later in the day my efforts to turn the camera on resulted in an error message in the rear display. My penultimate LX7 photo? One of the advantages of the LX7 is its small size enabled me to slide it through fences and gates to make images such as this one. The next frame was the last before the camera ‘coiled up’. It was one of three cameras I carried on 13 October, so I was able to continue making images. 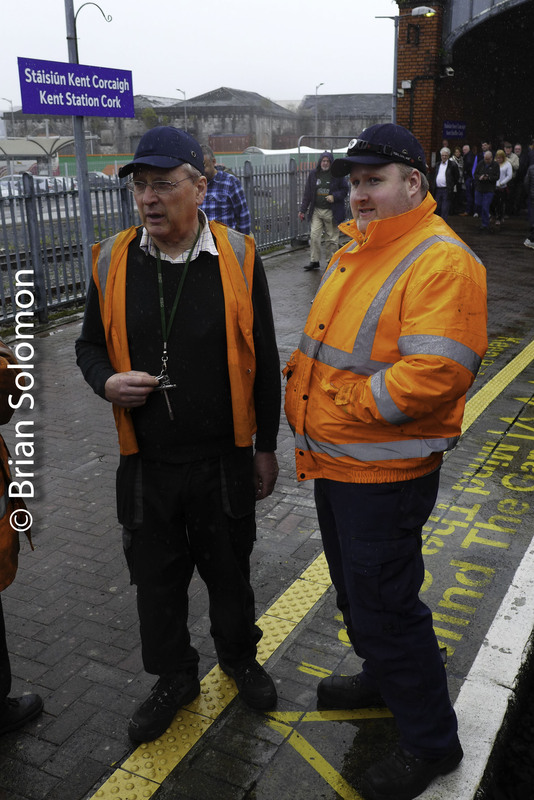 I never would have guessed that this photo of Irish Rail 088 at Cork would be the last I exposed with my Lumix LX7. I wonder if I’ll be able to revive this camera? In its more than four years of service I carried it with me everywhere and used it to make more than 79,000 shutter releases. 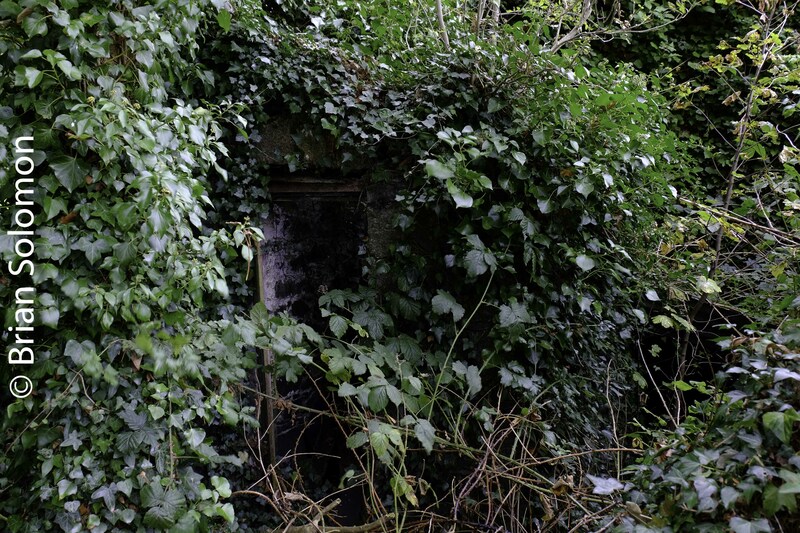 Photographing a Vestige at Ballywilliam. 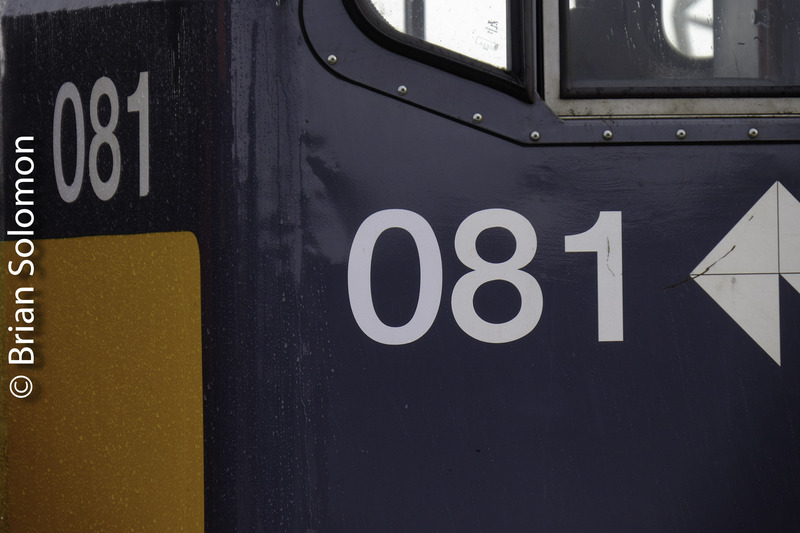 More Rain; 8 More Views of the RPSI Train. It was cloudy in Dublin; it was lashing rain in Ennis. At no time did we see the sun. Yet, it was a rewarding trip, and I’m happy with my photos. 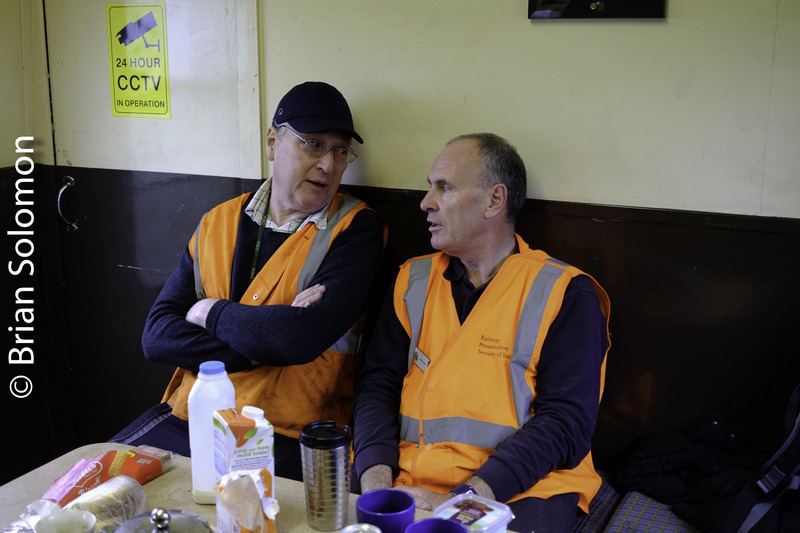 I made these views of Railway Preservation Society of Ireland’s ‘The Southwestern’ diesel tour using my FujiFilm XT1. Faces, Places and Engines—RPSI’s The Southwestern Tour—10 Views. 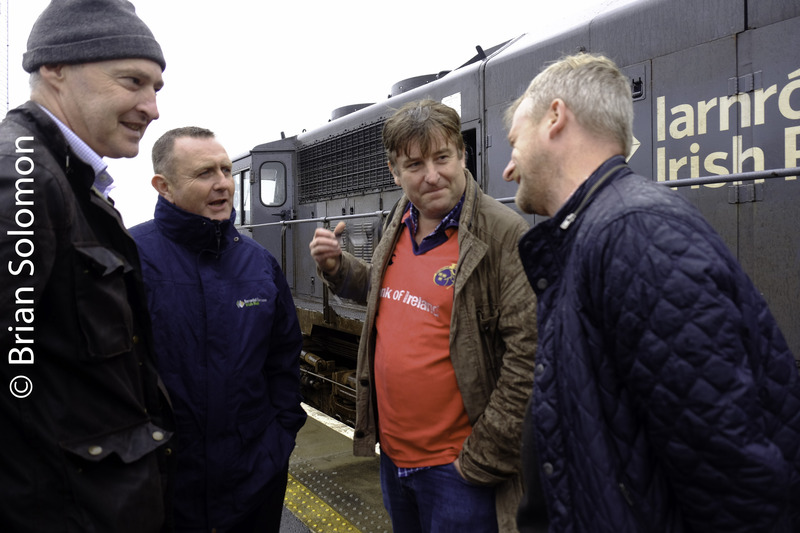 Although it was dark, wet and cold, I made a lot of photos of yesterday’s Railway Preservation Society of Ireland ‘The Southwestern’ tour. These views were exposed using my FujiFilm XT1. 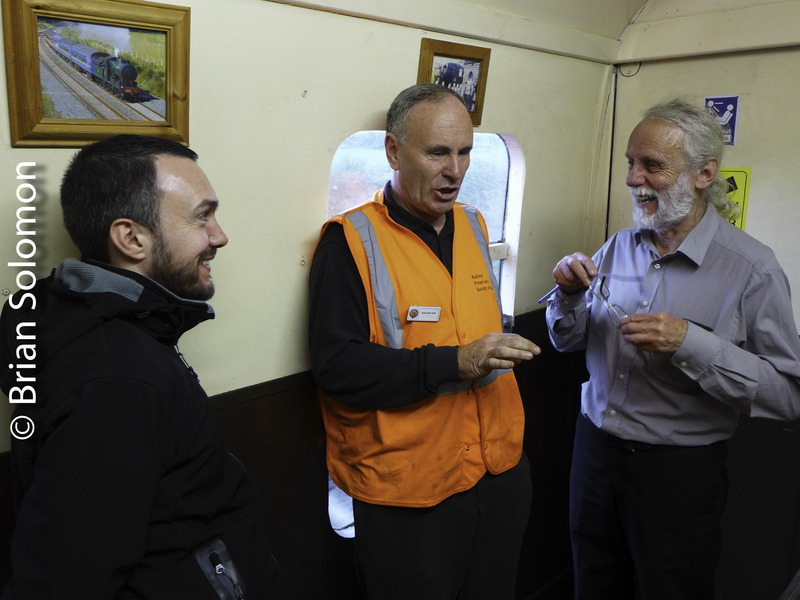 For me these tours are as much about the people as where we go or the equipment we travel on. 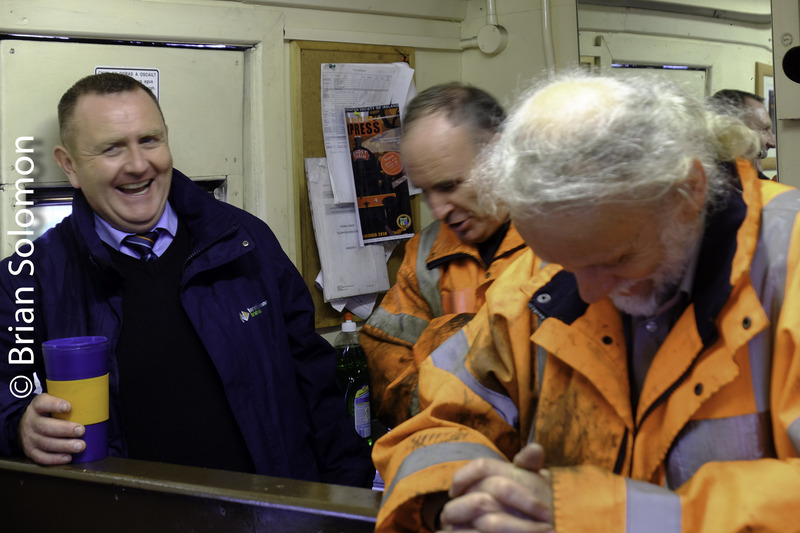 Noel gives the green flag at Athenry. 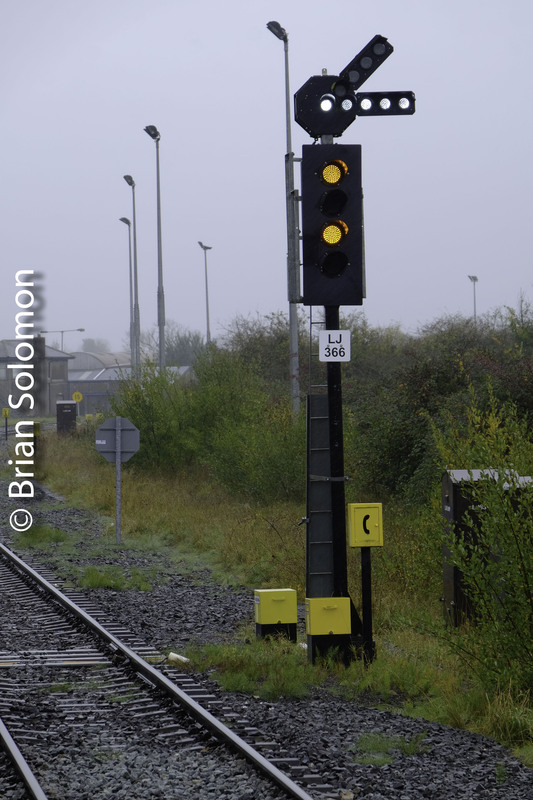 Limerick Junction: Photographing LED signals. 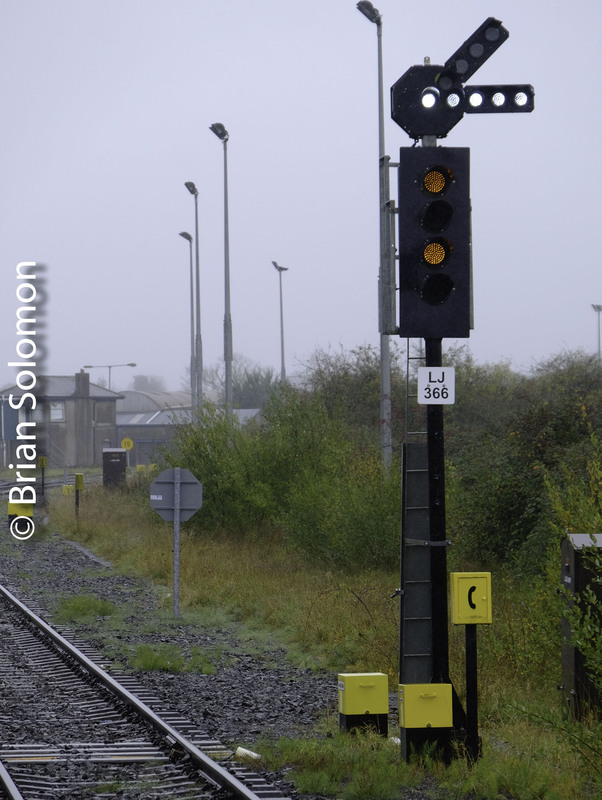 Yesterday, 13 October 2018, I exposed these views of an LED (light emitting diode) signal on Irish Rail at Limerick Junction. Take a careful look at the yellow aspects in the respective images. In the top photo, the yellow LEDs appear relatively dim (and much dimmer than they seemed in person). On the bottom photo these are brighter. Exposed at 1/400th of a second. Many LEDs do not produce constant light output and flicker many times a second. Although you cannot see this with your naked eye and the light output appears constant, in fact the light is blinking. When you use a fast shutter speed the camera only captures a portion of the light emitted and so the signal lights seem too dim. 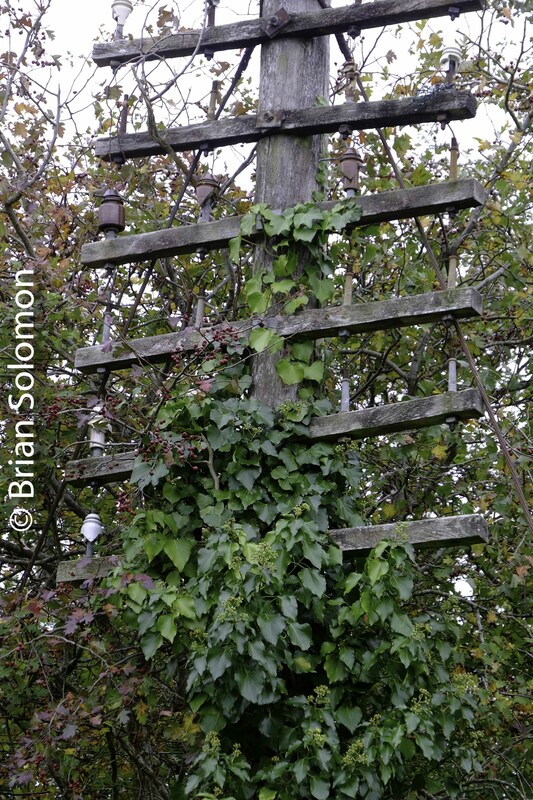 The key when photographing LED signals is to use a relatively low shutter speed. In this case 1/60thof second is much better than 1/400th. 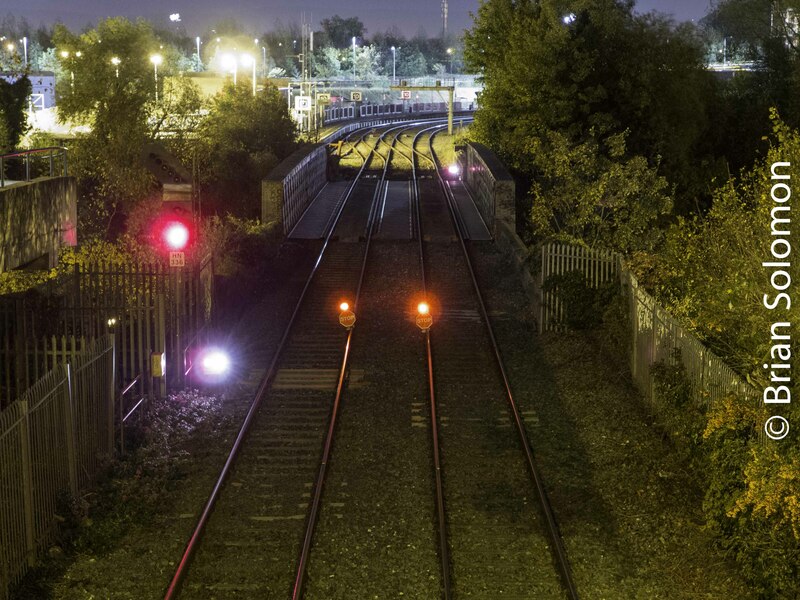 Another tip when making effective LED signal photos is to make the most of subdued lighting which can make the signals seem brighter than the light around them. Live from RPSI’s The Southwestern at Cork. 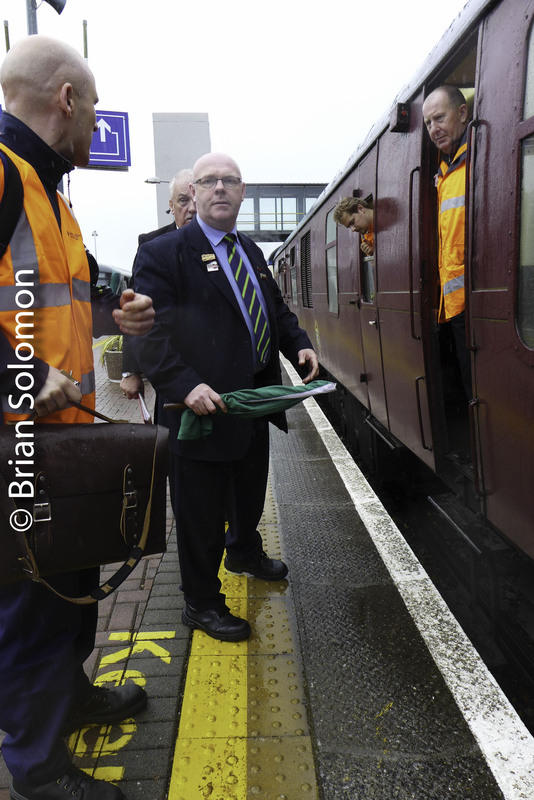 my Fujifilm XT1 to my iPhone of today’s Railway Presevation Society of Ireland rail tour. Sometimes it Rains . . . 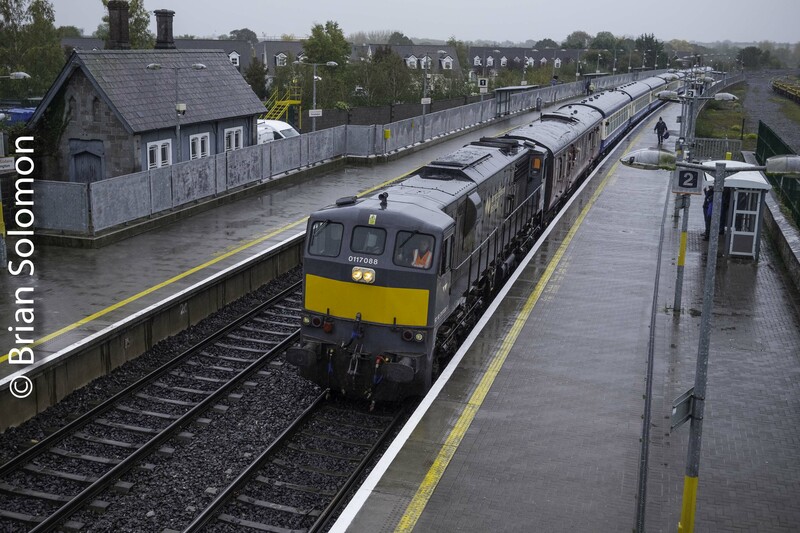 Yesterday 12 October 2018, I made this photograph of Irish Rail 083 leading the up IWT Liner in lashing rain at Monasterevin. FujiFilm XT1 with 90mm lens. 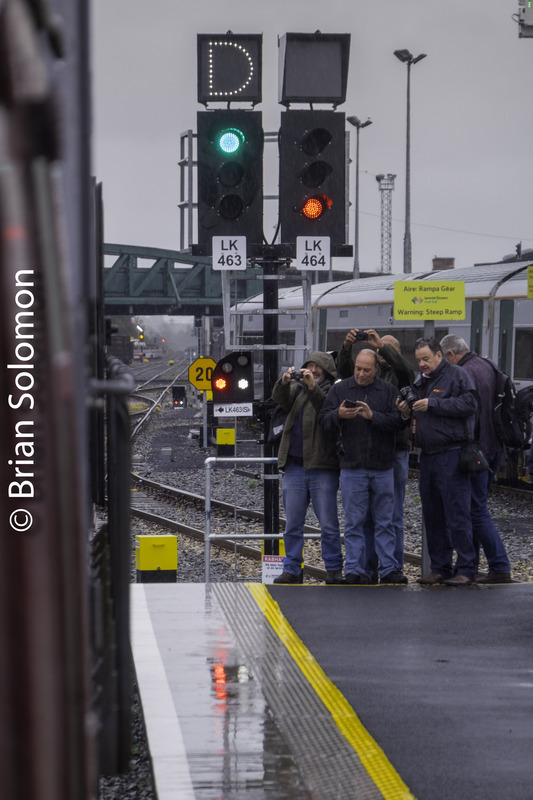 Tracking the Light aims to post Daily—Rain or Shine. 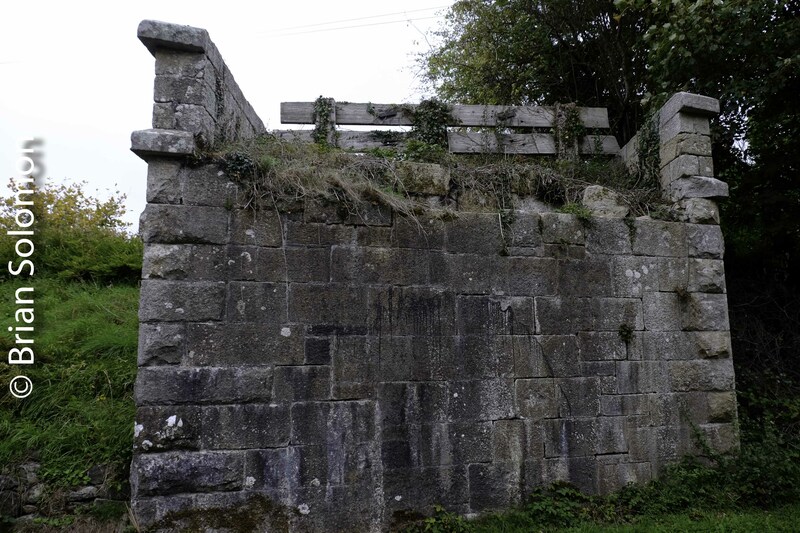 Magnificent Vestige at Borris, County Carlow. 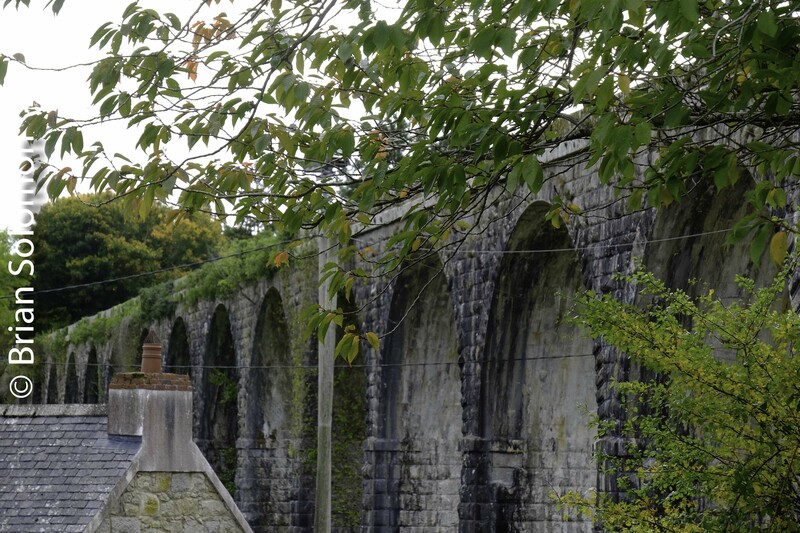 The Borris Viaduct is an impressive vestige of the closed Irish railway line from Bagenalstown to Palace East. Ken Fox, Donncha Cronin and I explored this old bridge, which has been converted into a hiking trail with easy public access. 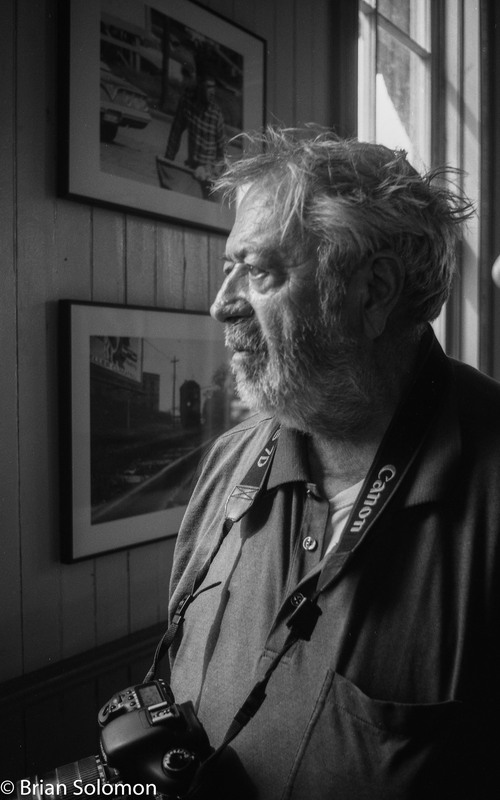 Photos exposed using a FujiFilm XT1 digital camera. Notice the effect of selective focus and soft light. This similar view has greater depth of field. 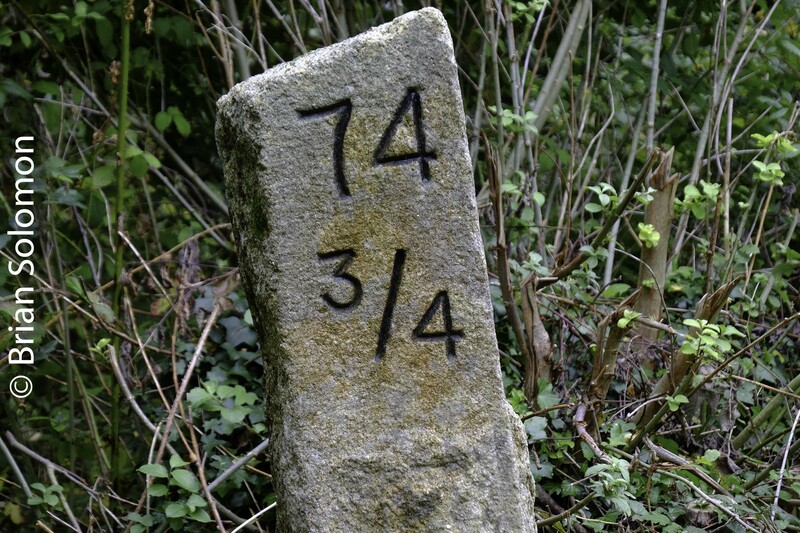 This old milepost is measured from Dublin and is located immediately south/east of the big bridge. 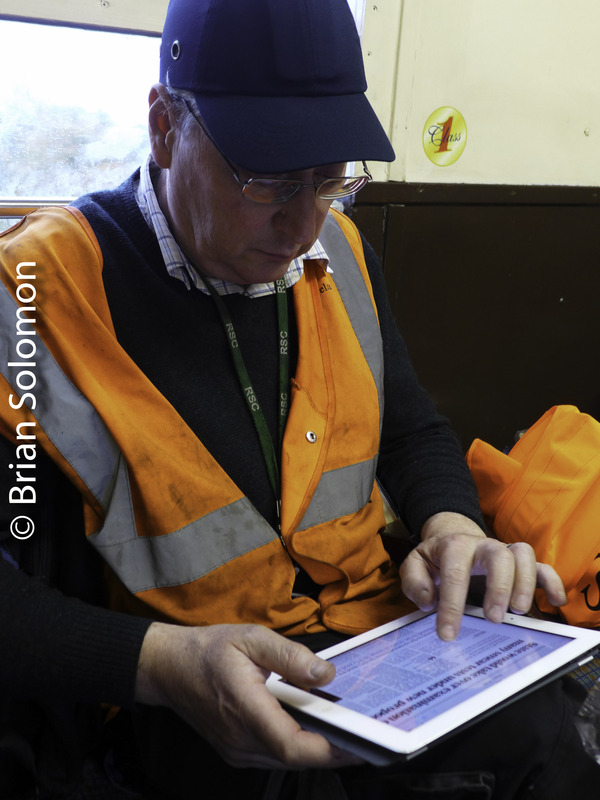 Tracking the Light examines railway photography daily. 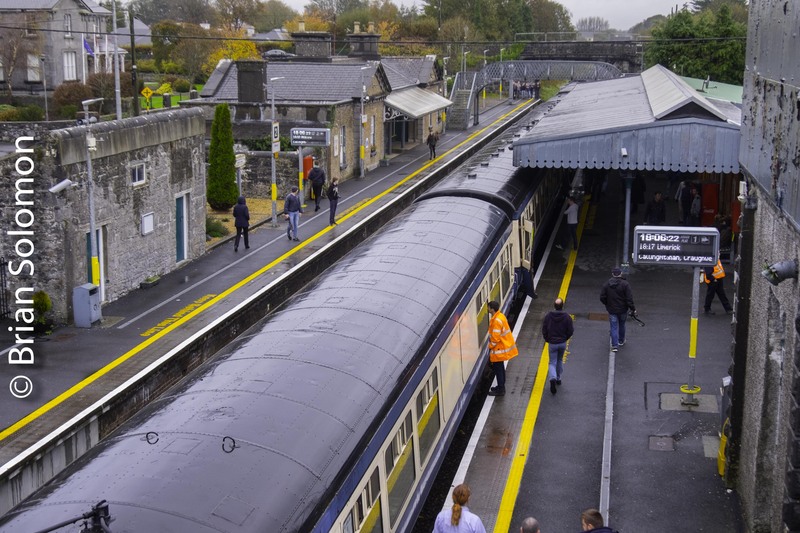 Exploring Historic Railways in Carlow and Wexford—Ten Photos. It’s not all about trains. It never was. 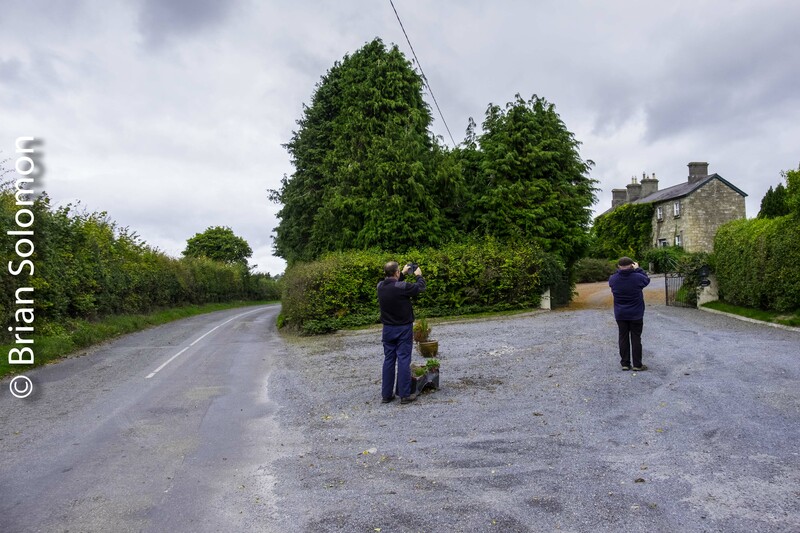 Over the weekend, Ken Fox, Donncha Cronin and I made an exploration of abandoned Irish railways in counties Carlow and Wexford. 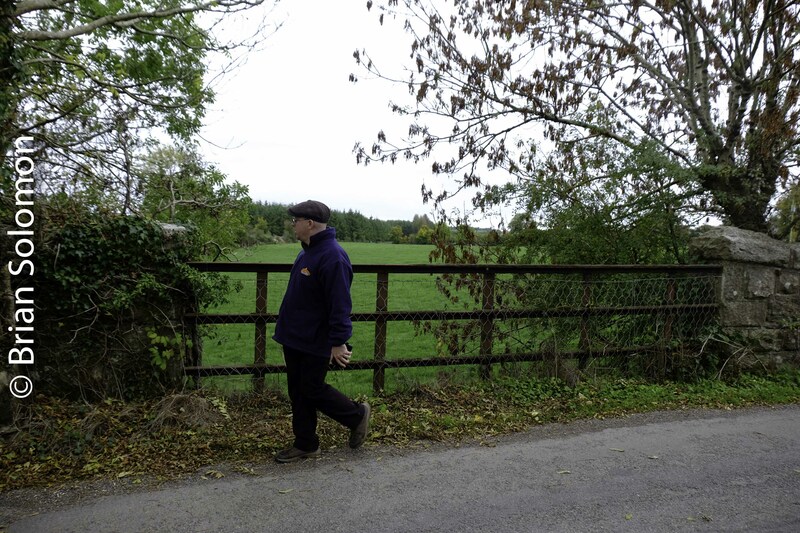 We began at Bagenalstown and worked our toward Wexford. 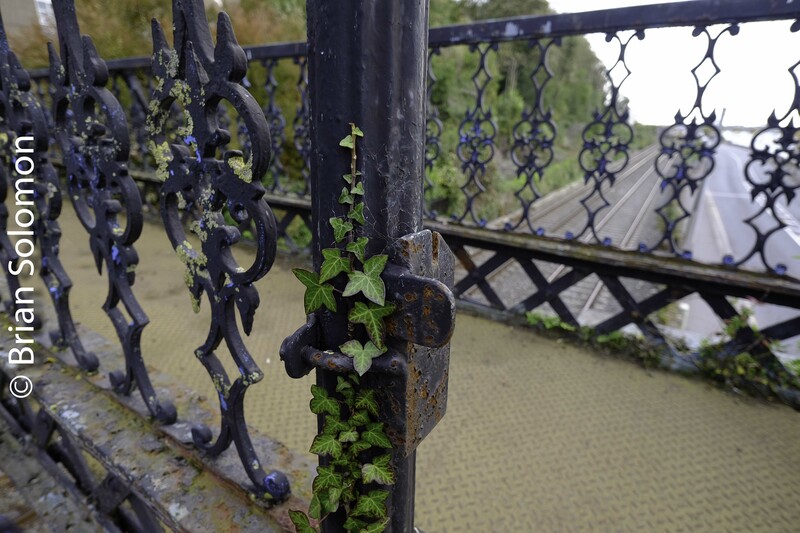 I find long abandoned railways inherently compelling, but sometimes difficult to convey in pictures. 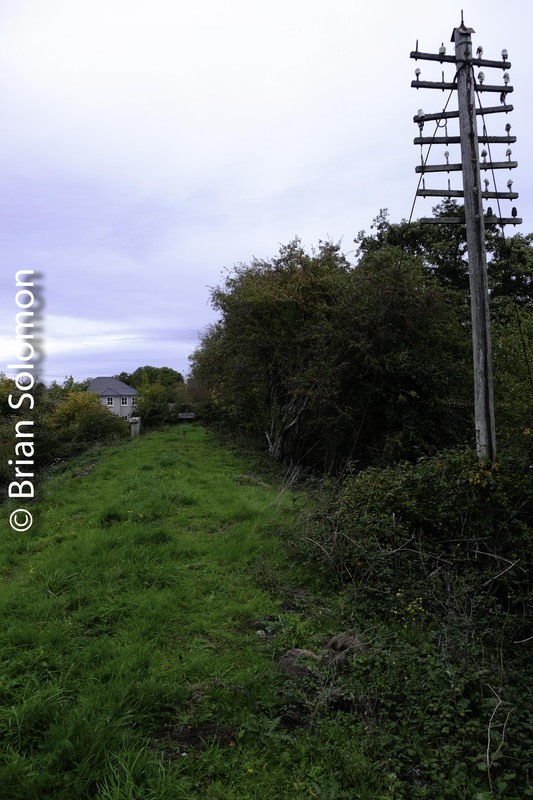 This is a selection of images from my FujiFilm XT1 on the Bagenalstown to Palace East route, a line shut to traffic in the 1960s. In some places structures, bridges and rights-of-way remain, in others the line has been reclaimed and there’s virtually nothing left to see. 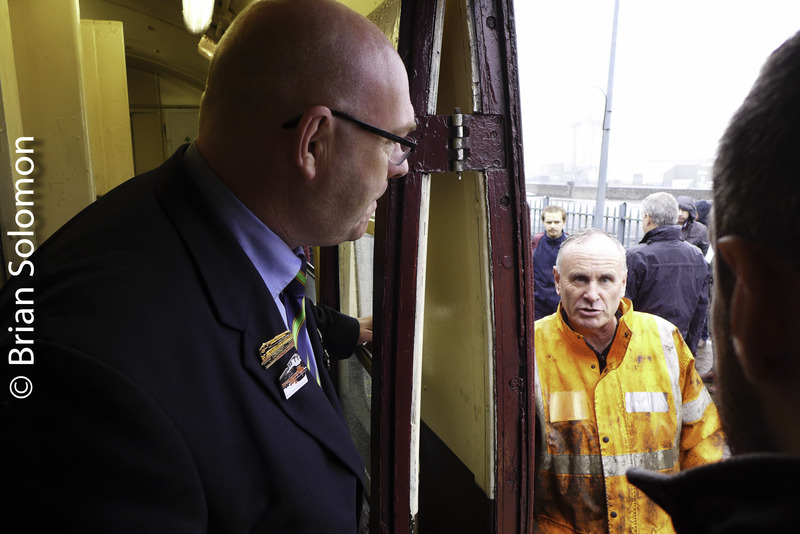 These photos are to convey the aura of the closed line, I’ve made no effort to place them in geographical order. In tomorrow’s post, I’ll cover the visual highlight of the line. 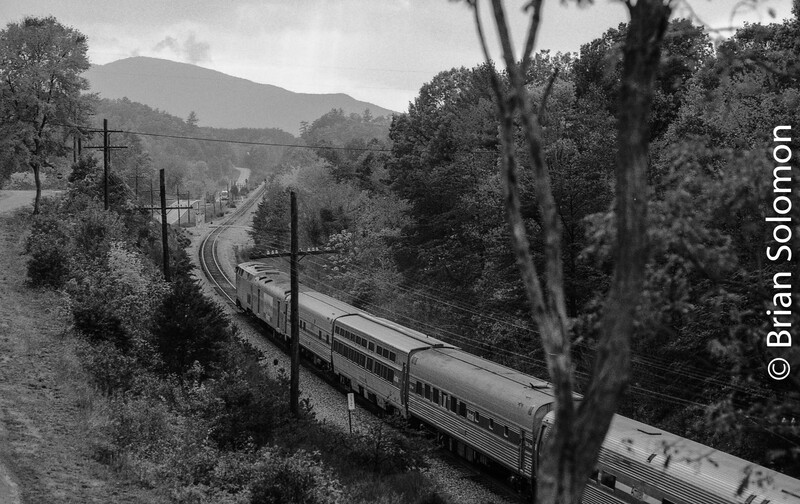 Tracking the Light explores railroad photography. 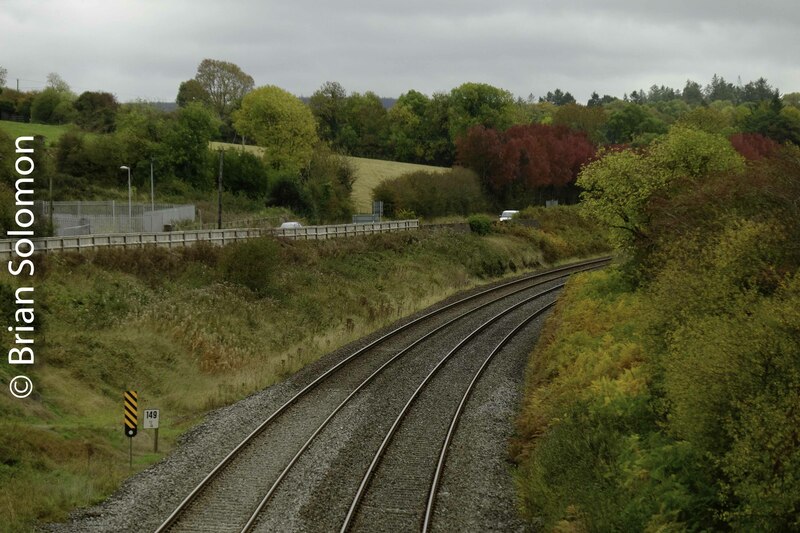 Irish Rail at Bagenalstown, October 2018—Fuji Zoom Lens Exercise. 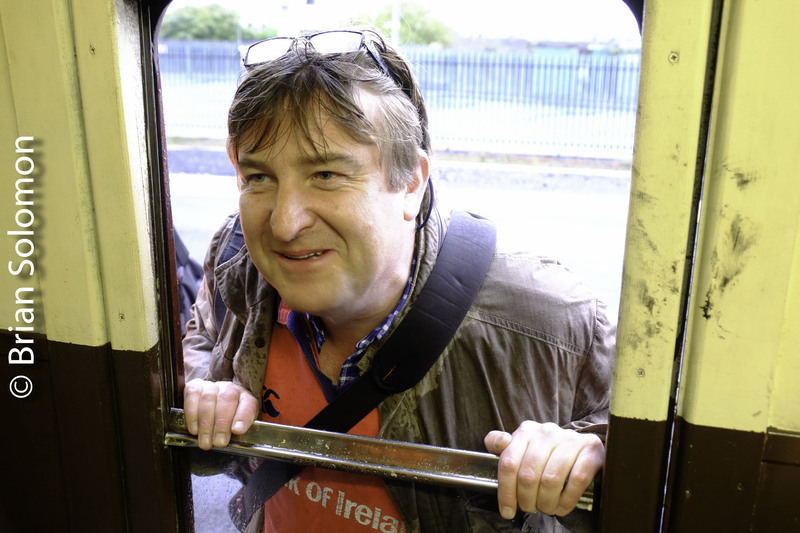 As I got off the down Waterford train from Dublin at Bagenalstown, County Carlow, I immediately began considering photo options. I didn’t have much time, because the train was only in the station for a couple of minutes. 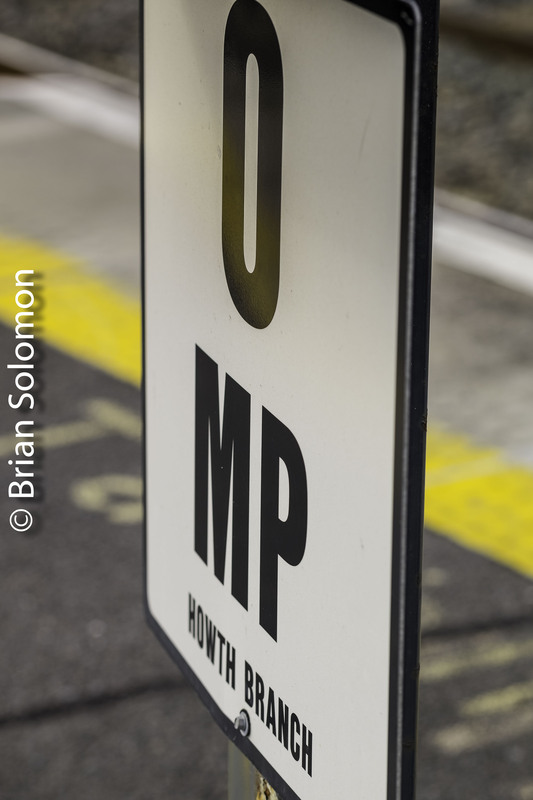 I took a position at the back of the Irish Rail ICR adjacent to the old station building, and made a series of digital photos using my FujiFilm XT1 with 18-135mm Fuji zoom lens. 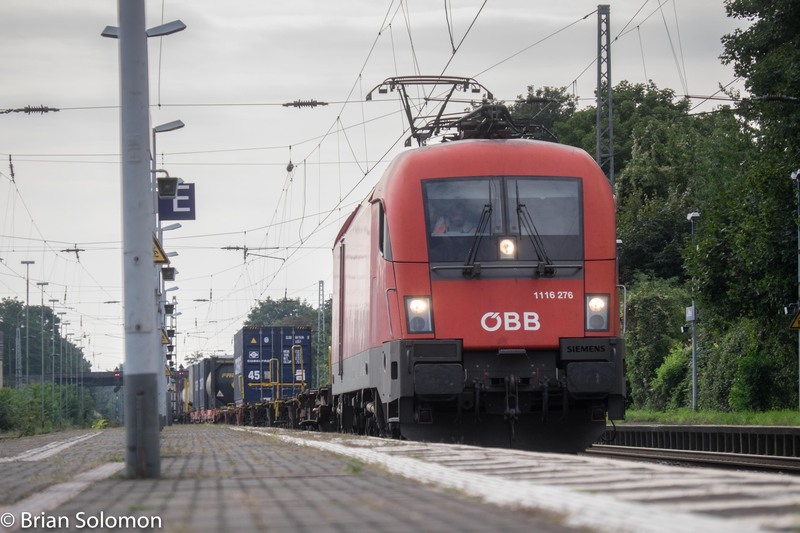 I’ve selected two of the sequence here: One wide angle, one telephoto; same camera, same location, same vantage point, same railcar, but different focal lengths. JPG from a RAW file that was adjusted for contrast and colour in post processing. Telephoto view from a Camera produced JPG without adjustment except for scaling. 225 from Platform 10 in 2003. 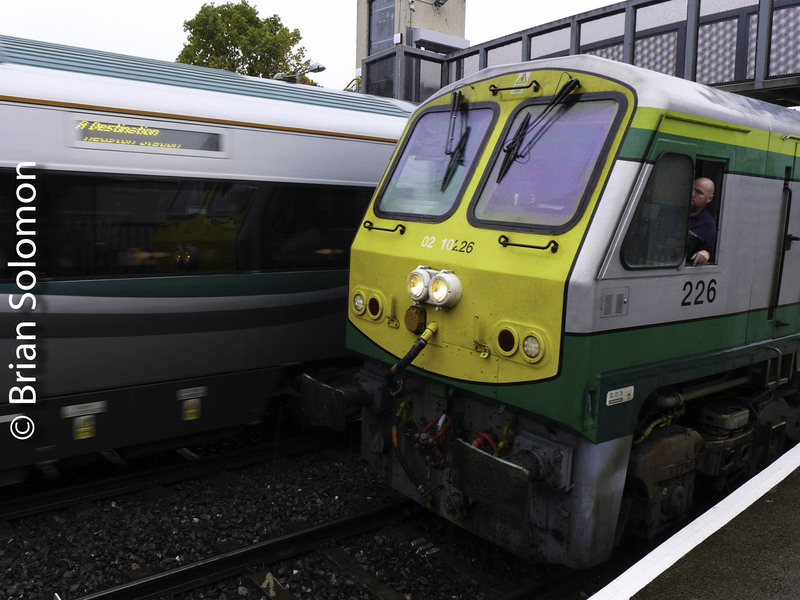 Irish Rail 225 was among other locomotives at Irish Rail’s Heuston Station in February 2003. Exposed on Black & White film using a Nikon F3. NIR Downhill, Co. Derry—Two Years Ago. 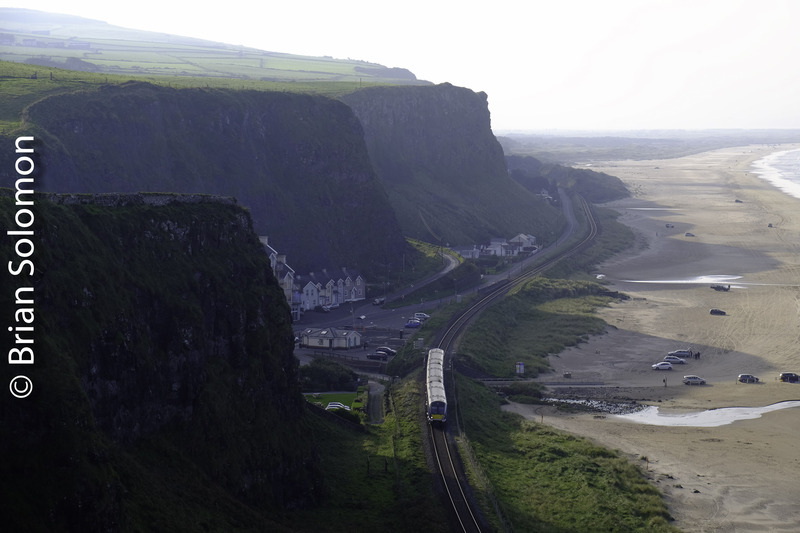 On this day, 8 Oct 2016, I made this view of an Northern Ireland Railways CAF at Downhill, Co. Derry on its run from Derry/Londonderry to Belfast. 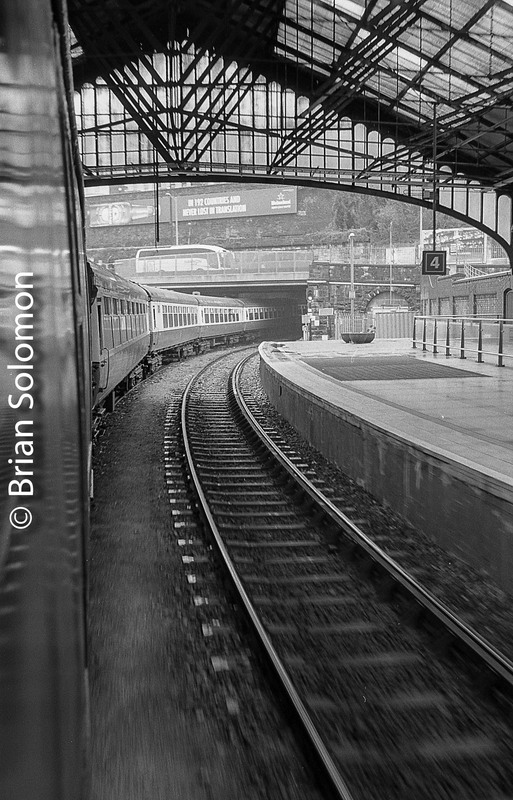 A similar view from this sequence appeared in my book Brian Solomon’s Railway Guide to Europe. The book is available from the Kalmbach Hobby Store and Amazon. 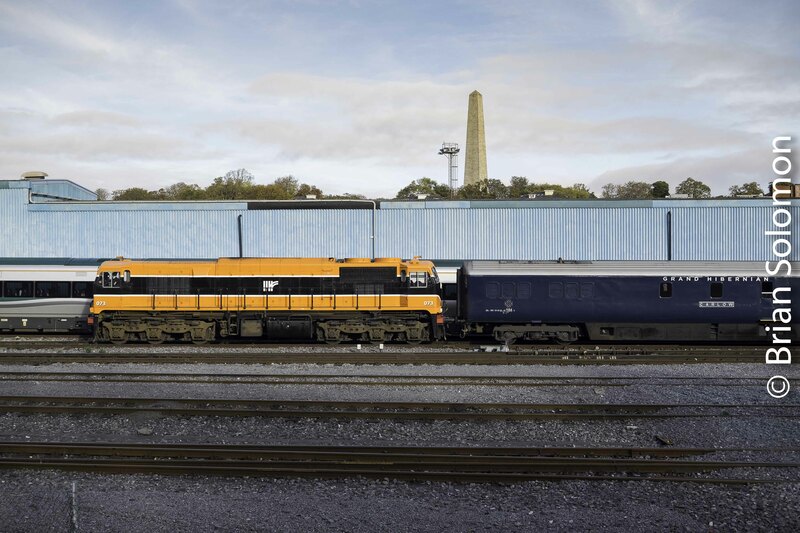 TONIGHT: Slide Presentation in Cork City on General Motors Locomotives in North America. 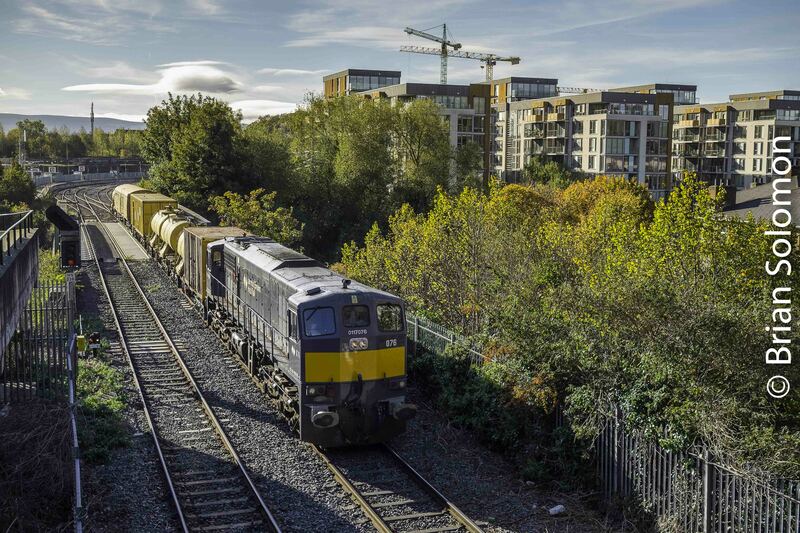 Tonight, Monday 8 October 2018 at 8pm, I’ll be giving a slide presentation to the Irish Railway Record Society in Cork on General Motors Diesel-Electric Locomotives in North America. 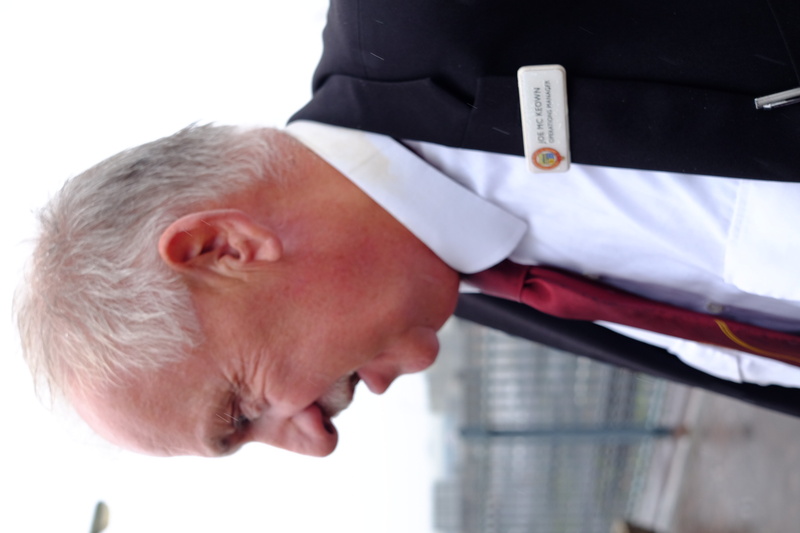 The talk will be held at the Bru Columbanus Meeting Rooms in Wilton, Cork City. 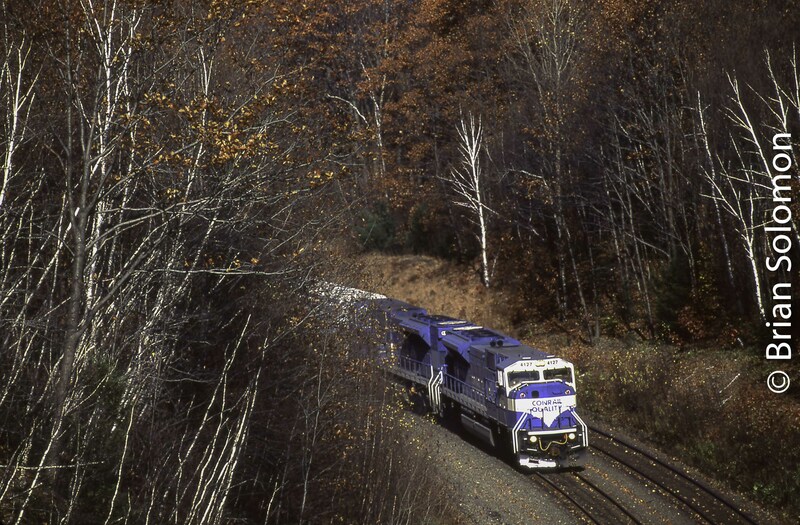 I will present a variety of colour slides detailing General Motors Electro-Motive Division diesels at work. 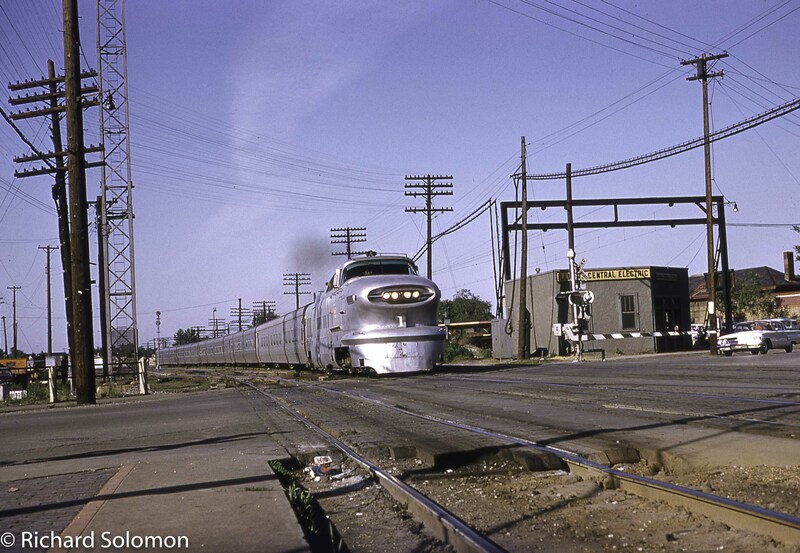 In June 1961, a Rock Island LWT12 with Aerotrain styling leads a TALGO-built consist at Blue Island, Illinois. Kodachrome slide by Richard Jay Solomon. Los Angeles Gold Line—June 2008. 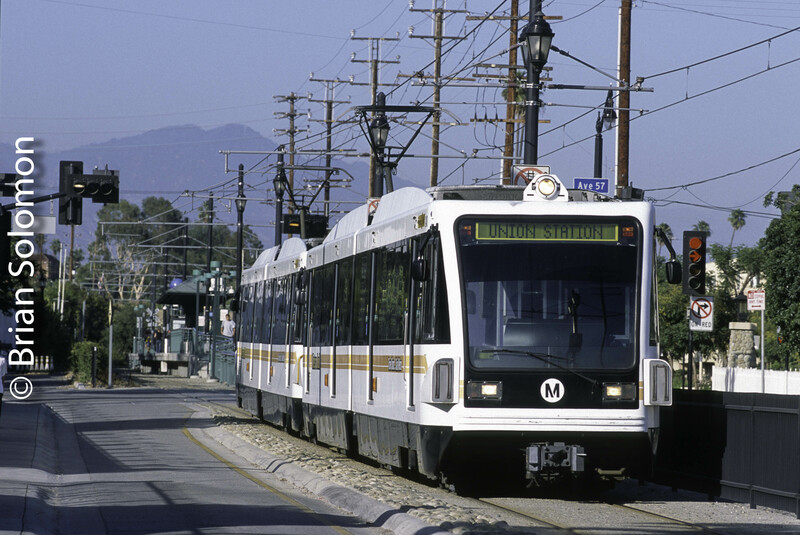 On a visit to Los Angeles in June 2008, I exposed this photograph of Metrorail’s Gold Line light rail at 57th Avenue. Exposed on Fujichrome slide film using a Canon EOS-3. 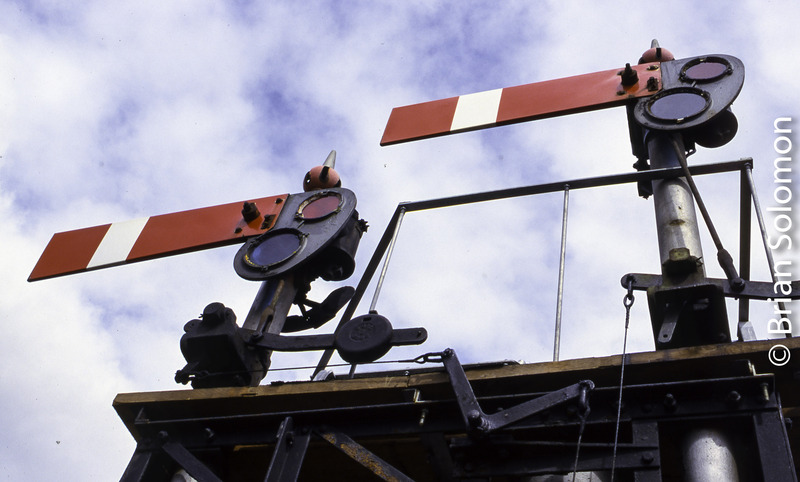 Lower Quadrant Semaphores at St. Erth, Cornwall. 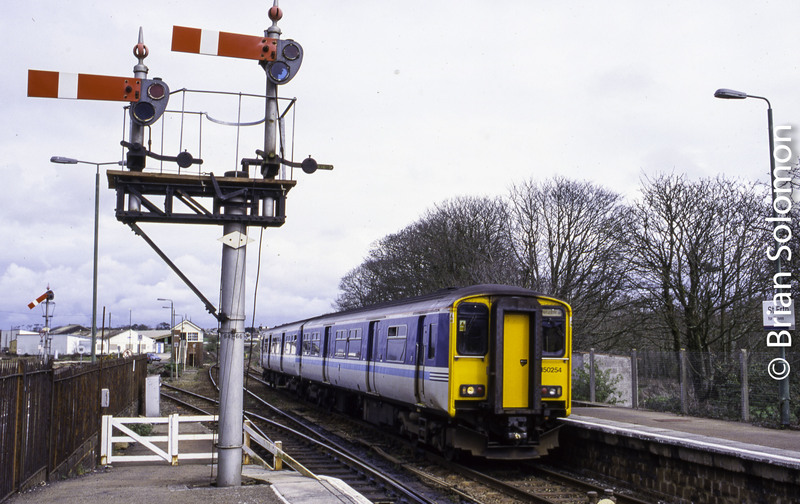 April Fools Day many years ago, My father and I visited St. Erth, Cornwall, where I made these Fujichrome Sensia II slides of the lower quadrant semaphores that controlled train movements there. Exposed using a Nikon N90S with Nikkor 28mm AF wide angle lens. 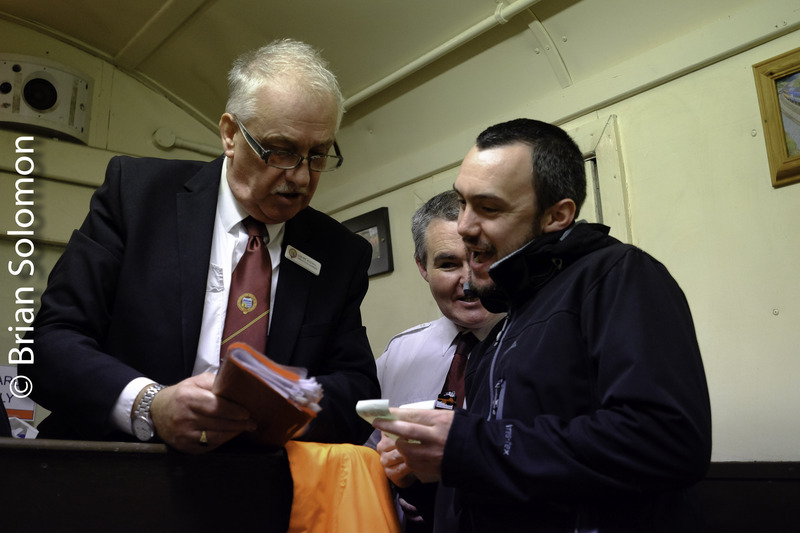 Trains Magazine has recently posted my sixth podcast, an interview with Mass Central’s Bob Bentley. Listen to this podcast and others in the series by clicking on the link below. Fujichrome color slide exposed using a Canon EOS3 with 24mm lens. 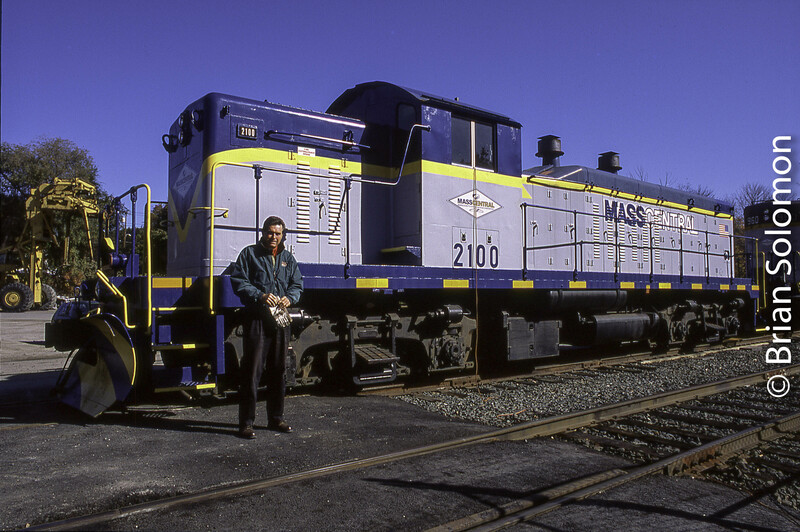 I made this photo of Bob with Mass-Central NW5 2100 on a fine October morning about ten years ago at the railroad’s Palmer, Massachusetts yard. 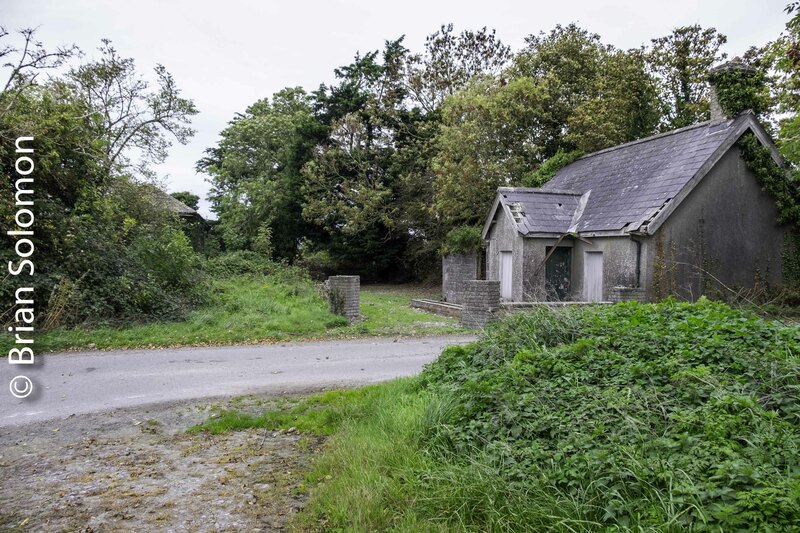 This will be among the photographs I’ll present this coming Monday (8 October 2018) to the Irish Railway Record Society in Cork. 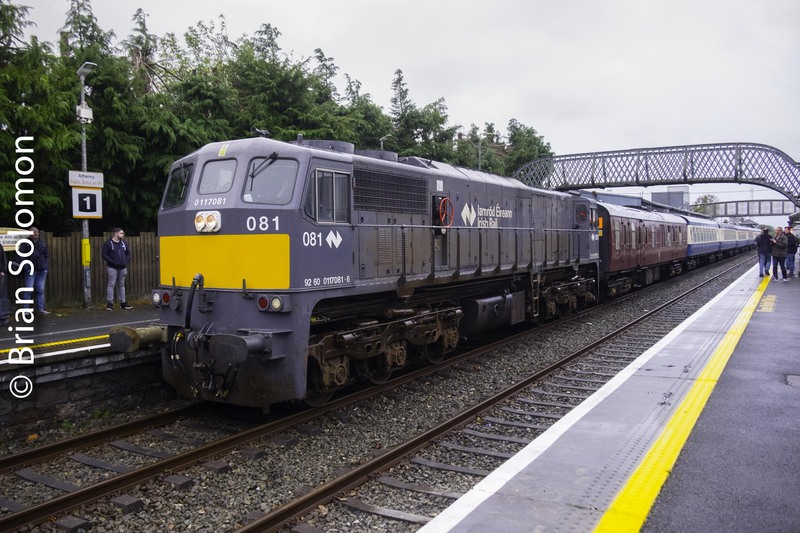 My talk, titled General Motors Diesel-Electric Locomotives in North America, will be held at 8pm on the 8thof October 2018 at the Bru Columbanus Meeting Rooms in Wilton, Cork City.